The Danish experimental artist and thinker Asger Jorn (1914-1973), well-known as one of the driving forces of Cobra (1948-1951) and L’Internationale Situationniste (1957-1972) was a fierce collaborator, always looking for international exchange and discussions, facilitating collective work, magazines, and exhibitions. 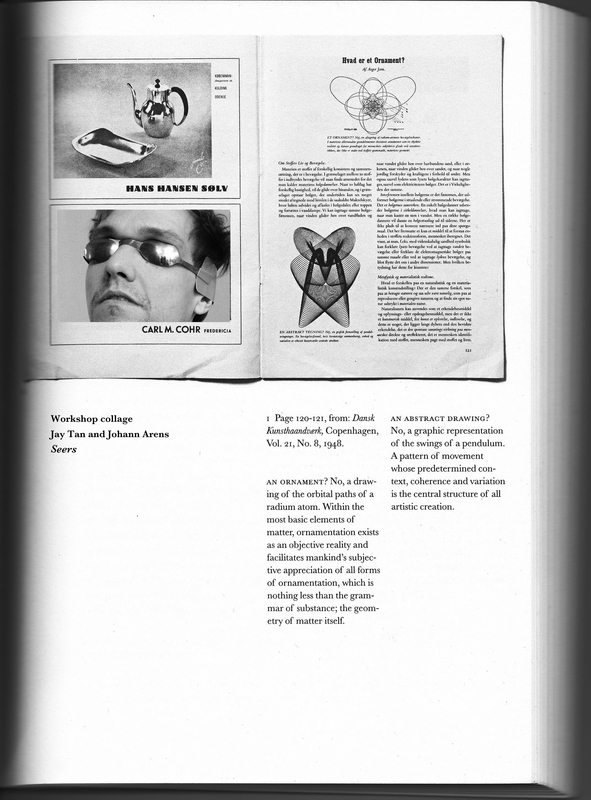 With great drive and ambition Jorn also wrote numerous books and articles envisioning, from an artistic point of view, ‘the first complete revision of the existing philosophical system’. Jorn believed that art is not derived from an ideology or worldview, but is the direct expression of an attitude towards life, belonging to the fundamental level of work and production. 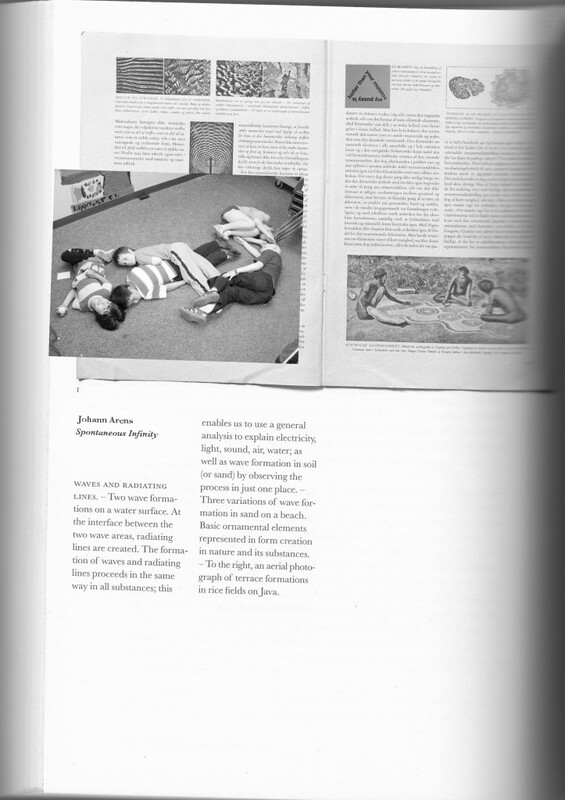 In line with this, Jorn combined in his writings ideas from a wide range of disciplines including politics, physics, economics, philosophy, anthropology, structuralism and art theory. He brought these various interests together via unconventional methods and in a vast variety of forms, in search of a comprehensive theory of art and life. 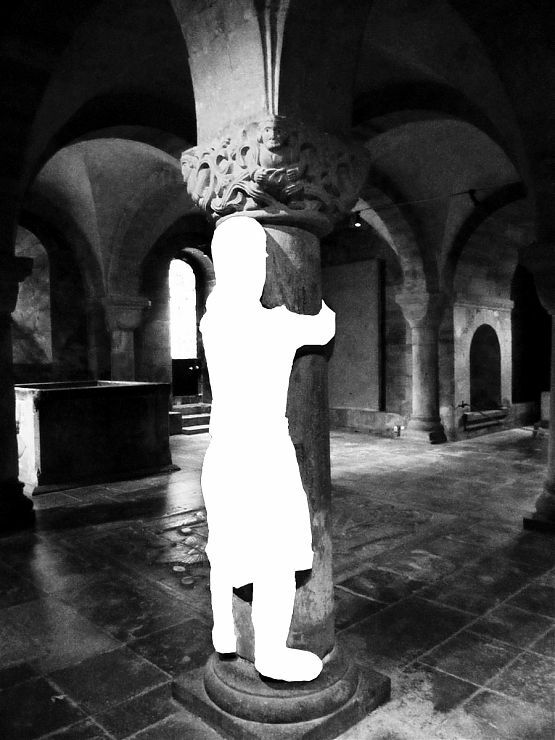 The architectural figure of the pillar-hugger as it appears in Jorn’s 12th Century Stone Sculptures of Scania1 represents a character whose body has become petrified while attempting to tear down a Cathedral by its vertical supports. A small group of artists have been invited to occupy the position of Pillar Huggers for a one-day visual symposium at Or Gallery Berlin where their work will form the material of their conversation. Transposing Jorn’s definition of a materialist attitude toward making art (as he articulates in the essay ‘What is Ornament’ (1948)) to exhibition-making, the artists are asked to animate the position of the body who, through its transformation into the inorganic, becomes the support for the very same edifice it attempts to destroy. 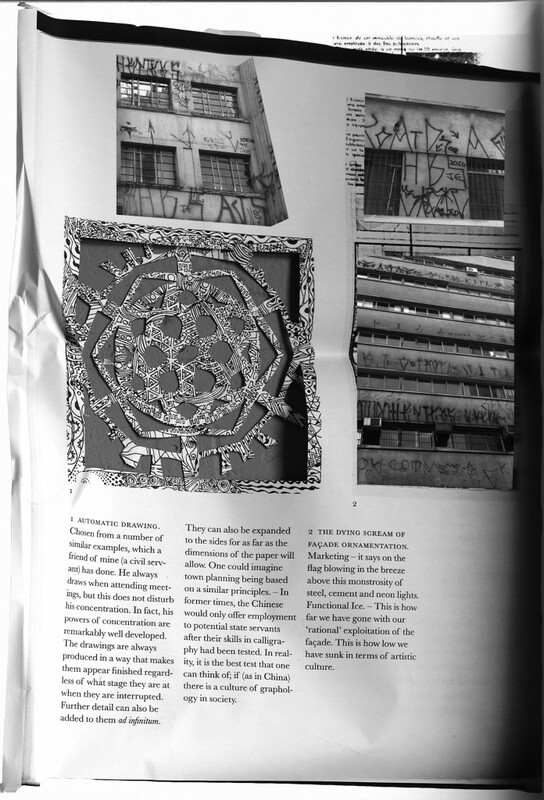 How can we reconcile the compulsion to ornament with a resistance to the compulsion to make an exhibition? Can we avoid the exhibition as monumental decoration by approaching the encounter of and between artwork with the spirit of Jorn’s conception of vandalism and the spontaneous arabesque? The remnants of the workshop opened to the public at 7:30 pm on January 23, 2015, and have also resulted in the visual essay What is Jornament? (published on this blog). 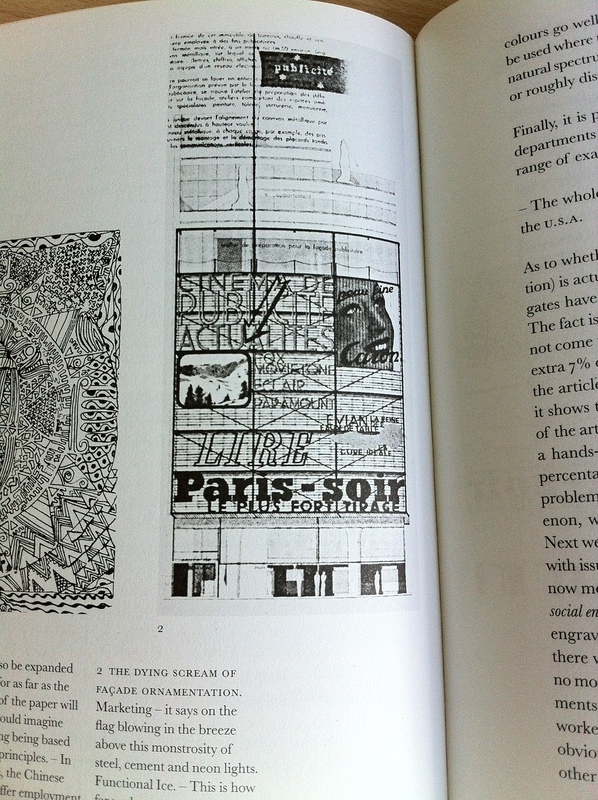 The text is taken from the book Fraternité Avant Tout – Asger Jorn’s writings on art and architecture, 1938-1958. Editor: Ruth Baumeister. Translator: Paul Larkin. 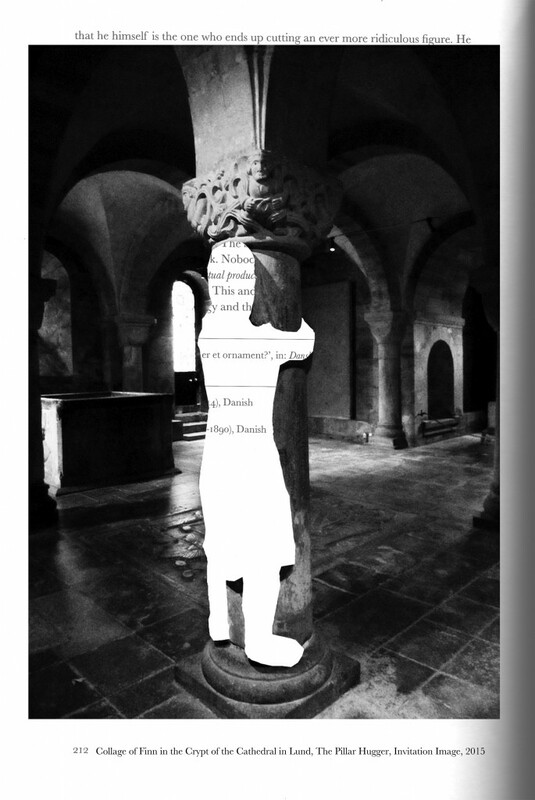 The book traces the infiltration of a non-Christian iconography of pillar-huggers, beard-pullers, and double-heads in the decorative programs of churches built in the aftermath of pagan Scania by the recently converted kingdom of Denmark around the year 1000. Klaus Weber is an artist, who lives and works in Berlin, he has shown extensively in both Europe and the United Sates. He conceives works across a variety of media and spatial units, which are often based on multifaceted technological interconnections and intricately organized production processes. Yet, by purposely manipulating everyday structures, the tracing of deviations and the exploration of the impossible, they undermine the metaphorical and actual power of a functionalist rationality. In doing this, Weber repetitively uses images of nature, and explores the sustainable potential of the untamable in a humorous and anarchic manner. Weber has had institutional solo shows at the Fondazione Morra Greco in Naples, the Nottingham Contemporary, the Secession in Vienna, the Hayward Gallery in London, as well as the Kunstverein in Hamburg. 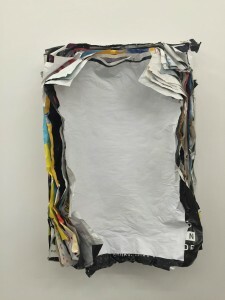 The artist has participated in group shows at the MOCA, Los Angeles, the Mori Museum in Tokyo and at the KW Institute for Contemporary Art, Berlin. 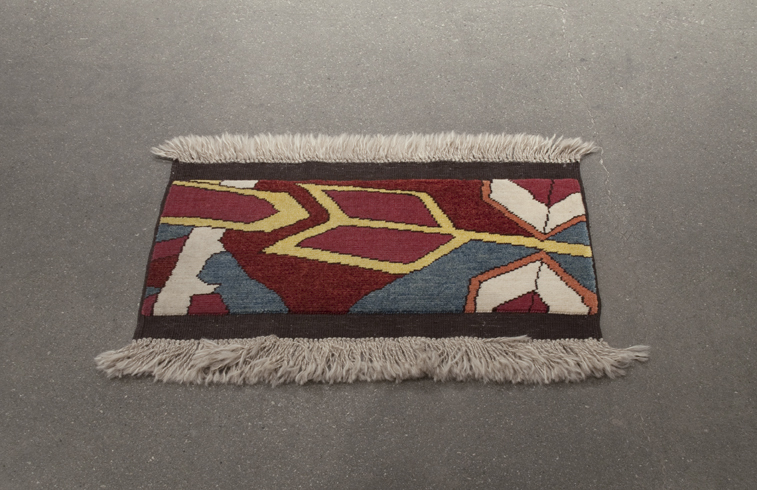 Weber is represented by Andrew Kreps Gallery in NY and Herald St Gallery in London. Shannon Bool (1972, Canada) originally from Vancouver Island, she attended Emily Carr University before studying in New York, Frankfurt and moving to Berlin were she lives and works. 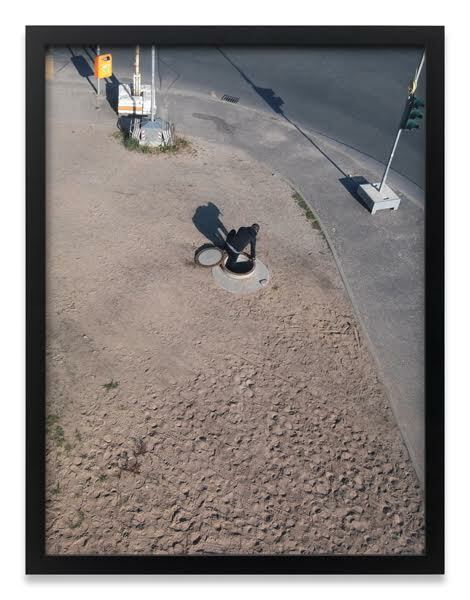 Solo exhibitions include: The Fourth Wall Through the Third Eye, Galerie Kadel Willborn, Düsseldorf; Walk Like an Etruscan, Daniel Faria Gallery, Toronto (2013); The Inverted Harem II, Bonner Kunstverein (2011); CRAC Alsace, Altkirch, France; The Inverted Harem, GAK-Gesellschaft für Aktuelle Kunst, Bremen (2010); RMIT Project Space, Melbourne, Australia (2008). Group exhibitions include MMK2 Boom She Boom, Works from the MMK Collection, Frankfurt; The Klöntal Triennale, Kunsthaus Glarus, Switzerland (2014); Soft Pictures, Fondazione Sandretto Re Rebaugengo, Turin; Painting Forever!, KW, Berlin; Justina M. Barnicke Gallery, Toronto (2013); the Sprengel Museum, Hannover (2012); 7×14, Kunsthalle Baden-Baden; Tactical Support, Gallery Tracy Williams, New York; Rock Opera, CACP Museum of Contemporary Art, Bordeaux (2009); Drawing on Sculpture: Graphic Interventions on the Photographic Surface, Henry Moore Institute, Leeds (2007); Make Your Move, Projects Arts Centre, Dublin; Spiralen der Erinnerung, Kunstverein in Hamburg; Carbonic Anhydride, Galerie Max Hetzler, Berlin (2006). Work is held in the collections of Berlinische Galerie Landesmuseum Fur Moderne Kunst, Fotografie und Architektur, Berlin; MMK Museum fur Modern Kunst, Frankfurt am Main; Lenbachhaus, Munich, and the Saatchi Collection, London. She is represented by Kadel Willborn Gallery in Düsseldorf and Daniel Faria Gallery, Toronto. Johann Arens (born in Aachen, Germany 1981). He uses installation and video to survey the documentary properties of public interiors. By systematically re-editing the hardware of a location he draws up an abstract inventory of the social textures inherent in the site. His work is an enquiry into the role of human interfaces, the desire to touch artefacts and the mechanisms of user behaviour. After graduating from the Gerrit Rietveld Academy in Amsterdam, he received a stipend by the Netherlands Foundation of Visual Arts to complete his MFA in Fine Arts at Goldsmith, University of London. Since then he has worked on public commissions assigned by Arnolfini / Art and the Public Realm, Bristol, Letchworth Heritage Foundation and Jerwood Foundation London. In 2013 he has been awarded the Rome Fellowship in Contemporary Art by the British Academy and has recently started his residency at the Rijksakademie in Amsterdam. Recent solo shows include ‘Internet Centre & Habesha Grocery’, Paradise Row, London; ‘Apple and Pear’, ASC Gallery, London; ‘Effect Rating’ De Service Garage, Amsterdam. Recent group shows include ‘New Contemporaries’, ICA London; ‘No Soul For Sale’ Festival, Tate Modern, London; ‘A useful-looking useless object’,Sierra Metro, Edinburgh; ‘I’ll explain you everythiinnngggg’, Chert, Berlin; ‘Hard Copy’, Pastificio Cerere, Rome, 2014 and ‘TTTT’, Jerwood Space, London. Hilde de Bruijn (1971, NL, lives and works in Amsterdam) is a freelance curator and a curator at the Cobra Museum of Modern Art, Amstelveen. Her main freelance activity at the moment is a curatorial research into the writing and thinking of Asger Jorn (1914-1973) which builds a starting point to re-think issues in contemporary artistic and discursive practices – see also www.hildegoesasger.org. She is the co-editor of ‘ Archive Crisis’ , an artists´ book by Stefanos Tsivopoulos, designe Node and to be published by Japsam Books in Autumn 2015. Between 2007 and 2010 she was Head of Exhibitions at SMART Project Space, Amsterdam. She was an advisor for the NL Film Fund, the Mondriaan Foundation and City of Utrecht. Hadley+Maxwell (artists duo since 1997, Canada, live and work in Berlin). Hadley+Maxwell’s installations, performances and writings, employ diverse media to rework iconic images and traditional forms as they are expressed in pop-cultural, artistic and political movements. They cut into reified narratives via direct touch, transposition and refiguration, putting into play the absences cast in relief. Hadley+Maxwell have been collaborating since they met in Vancouver, Canada, in 1997. Public presentations of their work have included solo exhibitions at Artspeak (Vancouver), Contemporary Art Gallery (Vancouver), Künstlerhaus Bethanien (Berlin), Kunstverein Göttingen (Germany), Smart Project Space (Amsterdam), and Project Art Centre, Dublin, and group exhibitions at galleries and festivals including the Vancouver Art Gallery, Kunstraum München, the Power Plant (Toronto), the National Gallery of Canada, Taipei Fine Arts Museum, the Seattle Art Museum, La Kunsthalle Mulhouse (France), Witte de With (Rotterdam), the 4th Marrakech Biennale and the 19th Biennale of Sydney. They are represented by Jessica Bradley, Toronto, and live and work in Berlin, Germany. Christoph Keller, born 1967 in Freiburg/Breisgau, studied Mathematics, Physics and Hydrology in Freiburg, Berlin and Santiago de Chile, at the University of Arts, Berlin and at the Academy of Media Arts, Cologne. Selected solo exhibitions and projects include: Small Survey on Nothingness, Schering Stiftung, Berlin (July 5 – October 4, 2014);Expedition Bus – Shaman Travel, Presentation at abc Berlin (2012); Aether between cosmology and consciousness, Nouveau Festival Du Centre Pompidou, Paris (2011); Voyages Extraordinaires, CRAC Alsace Lorraine, Altkirch (2010), Observatorium, Kunstverein Braunschweig (2008).Recent group exhibitions include: Realität und Fiktion, Villa Schöningen, Potsdam (2013); Ghostbusters – or how to stress photography, Kunsthal Charlottenborg, Copenhagen (2013); Virtuosity – A concert on skill and disruption, strength and nonchalance, morale and cheating, Berliner Philharmonie, Berlin (2013); L’Institut des archives sauvages, Villa Arson, Nice (2012) and The Worldly House, Archive for dOCUMENTA (13) (2012). The exhibition at Or Gallery took place in collaboration with the Embassy of Canada. July 11th, 2015, posted in Comparative Vandalism, Public Sessions and Lectures, What is an Ornament? What is Jornament? 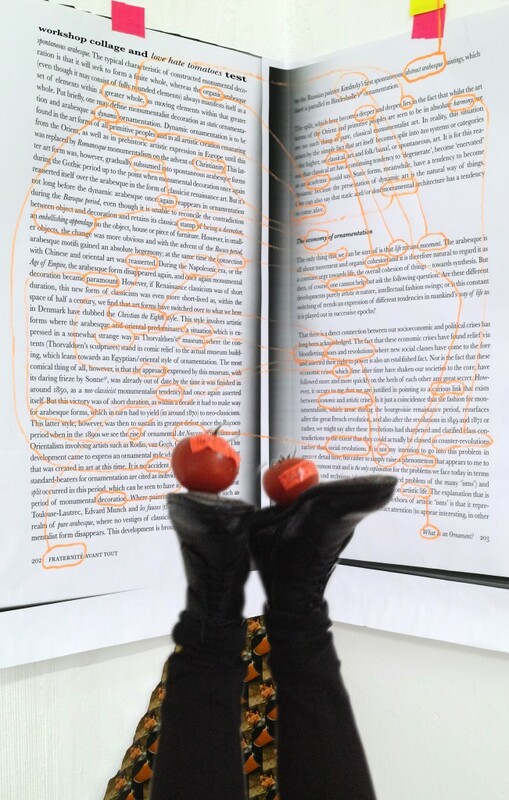 is a visual essay created by artists Shannon Bool, Hadley+Maxwell and Jay Tan making use of enlarged copies of the English translation of Asger Jorn’s text ‘What is an Ornament?’ from 1948. The text is taken from the book “Fraternité Avant Tout – Asger Jorn’s writings on art and architecture, 1938-1958.” Editor: Ruth Baumeister. Translator: Paul Larkin. 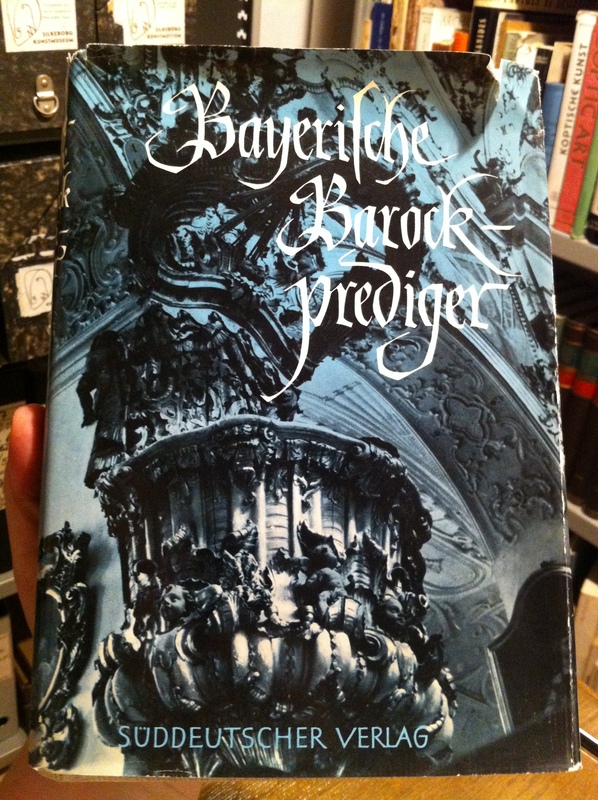 Publisher:010 Publishers. 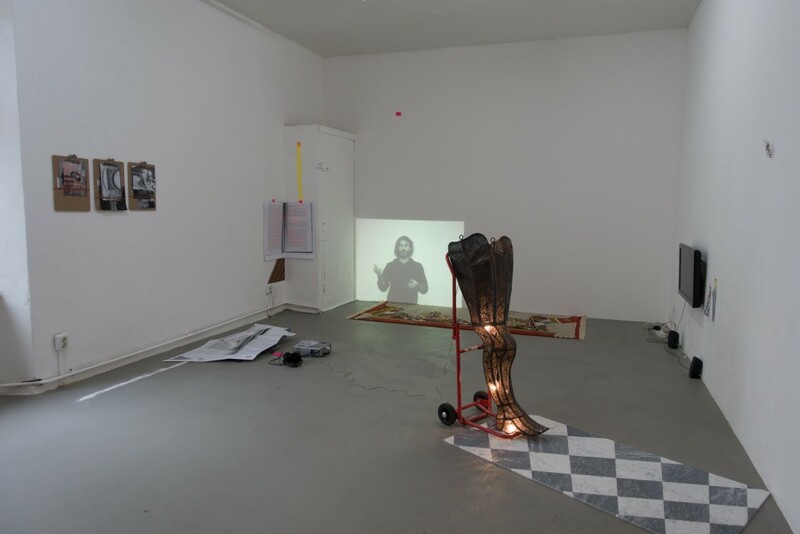 In their response to the text the contributors made use of a variety of materials that were brought to or resulted from the workshop Pillar Huggers at Or Gallery, Berlin which was held in January 2015 and also culminated in an intimate exhibition. Christoph Keller (who did not participate in the workshop) contributed the cover image of the visual essay. Participants in the workshop were: Johann Arens, Shannon Bool, Hilde de Bruijn, Hadley+Maxwell, Antonis Pittas, and although not physically present, Klaus Weber. July 11th, 2015, posted in Public Sessions and Lectures, What is an Ornament? The entry below is an email exchange that took place after a workshop in the framework of hildegoesasger at Officin (Copenhagen) where Niels Henriksen presented his research on Asger Jorn’s Scandinavian Institute of Comparative Vandalism (SISV) and Ellef Prestsæter together with Nicolas Malevé presented the work in progress of the Scandinavian Institute of Contemporary Comparative Vandalism (SISSV), an experimental art/research project engaging with the archive of the SISV at the Museum Jorn. 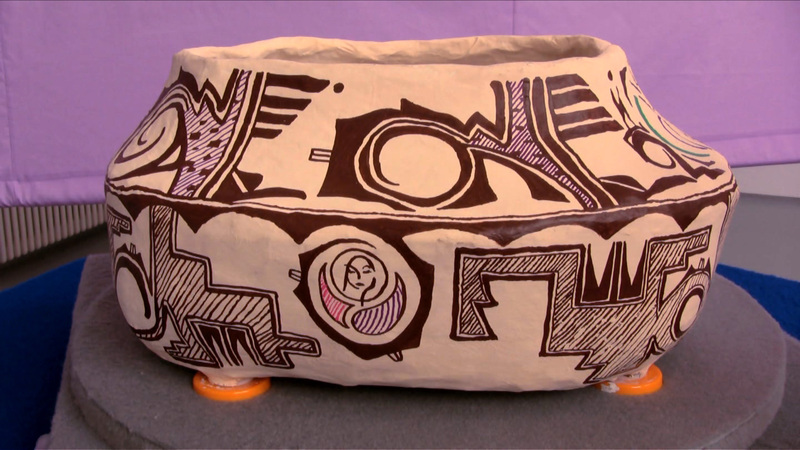 Niels Henriksen is a Ph.D. candidate in the Department of Art and Archaeology at Princeton University, USA. He is currently preparing a thesis on the adaptation of archaeological concepts and procedures in Asger Jorn’s book projects and paintings from 1948 to 1965. Ellef Prestsæter is an independent researcher, artist, and curator. He is a founding member of the SISSV, together with Michael Murtaugh and Nicolas Malevé. 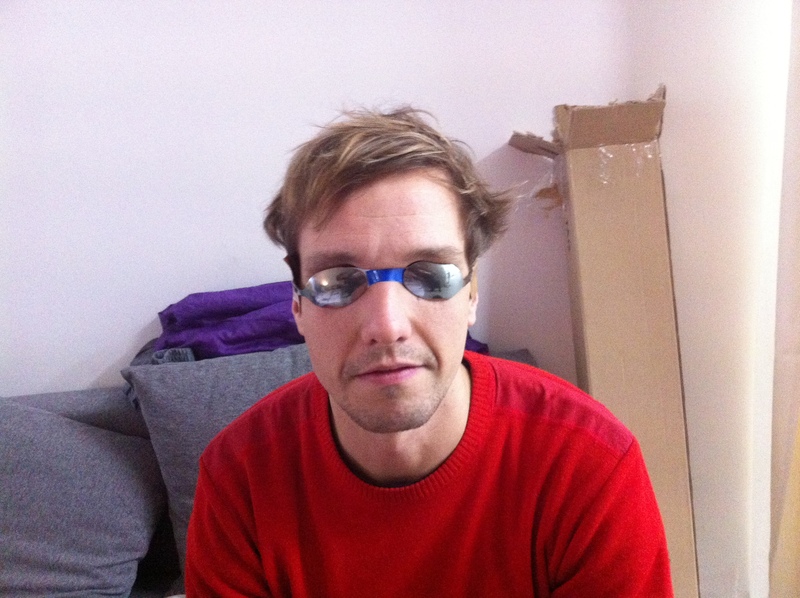 He works at the University of Oslo and writes regularly on art and literature for Klassekampen, Vinduet and Kunstkritikk. Most recent publication: The Invention of the Bright Day by José de Almada Negreiros, translated from the Portuguese into Norwegian and Reports from the Gutenberg Galaxy (http://www.obs-osv.com/gutenberg). Asger Jorn founded the Scandinavian Institute of Comparative Vandalism (SISV) in 1961, shortly after leaving the Situationist International. Jorn published a series of theoretical “reports of the SISV” and planned the production of some thirty volumes of coffee table books devoted to 10,000 Years of Nordic Folk Art. 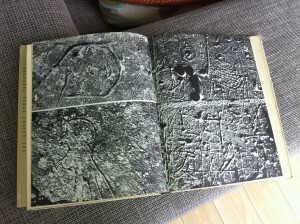 Eventually only a pilot volume on 12th Century Scanian Stone Sculpture was published. An archive consisting of more than 25,000 negatives taken by Gérard Franceschi and Ulrik Ross (commissioned by Jorn) bears testimony to the magnitude of the endeavor. NH: My first question regards your framing of your intervention this summer with the SISV in terms of a sort of manual for operating the archive. I am interested in the structures you identified in the original archive, and how you chose to engage with them. EP: When we started working with the SISV archive at Museum Jorn in Silkeborg, the first thing we needed to do was to develop an understanding of how the archive works, to map the relations, conjunctions and affordances[i] of the archival apparatus. There are more than 25,000 negatives in the filing cabinet. They are all ordered according to geographical location. The corresponding contact sheets as well as enlargements are indexed with a code unique to each image. Thus this image of a wooden stool, to take a random example, is indexed as N7-2-29. N indicates Norway, 7 means that the image was shot in the county of Oppland, 2 gives the further geographical specification of the Gudbrandsdalen valley and 29 is the number given to this specific image. The key to all of this is a document we refer to as the “white binder”. The binder was produced in the 80s by Stephanie Nørgaard, who was given the task of cleaning up the archive and has been an invaluable source of information for us. Interestingly, she told us that in order to crack the code of the index, she would start with Jorn’s published books (where some of the photos were reproduced) and work her way backwards to the photo archive, reverse-engineering the image articulations of the book, so to say … The white binder maps the overall structure of the repository very well. However, it does not encompass all the material remains of the SISV. Working with the images, Jorn would select the images he wanted to use for some purpose and put them in boxes. 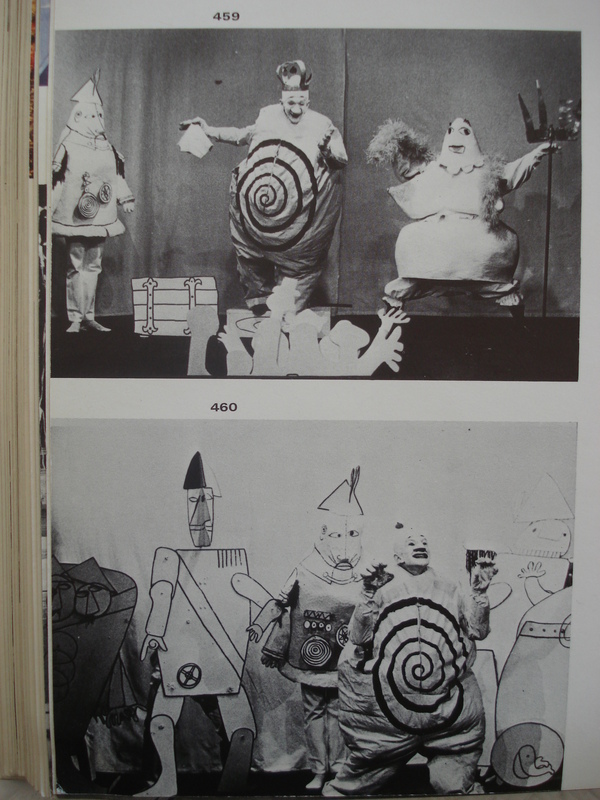 Later he would order the images in a particular sequence by putting them into albums that served as mockups for the planned books. A large number of images have been preserved in both “states” of ordering: there are more than 50 boxes and a number of albums. The boxes and albums are not stored in the filing cabinet (indeed they are usually stored in a different part of the museum building; our exhibition at the Museum Jorn this summer brought them into proximity with each other as we moved everything into one room). The boxes and albums bear witness to different stages of Jorn’s work with the images, or so it would seem. 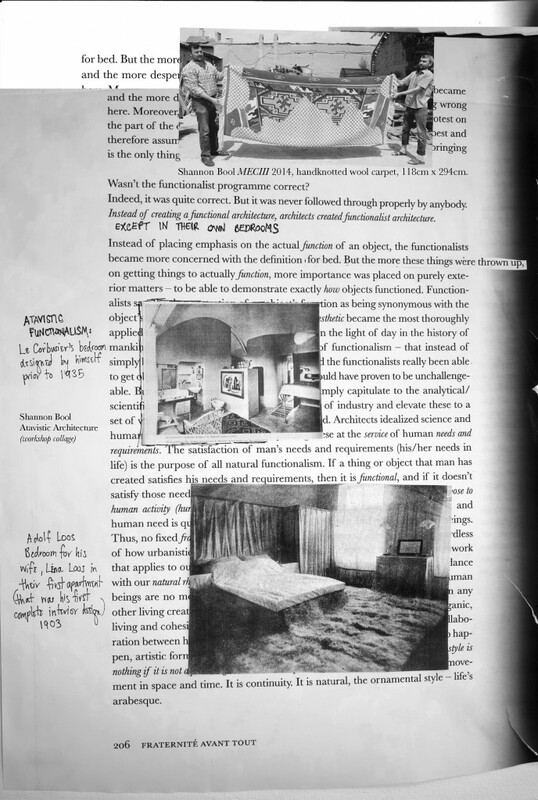 Each box and album contains a typewritten sheet where someone (Stephanie says it wasn’t her) has duly indexed its contents, adding a brief annotation of the depicted object. N7-2-29 for instance, appears in an album indexed as Modern times. Volume 6. The common people’s art of wooden images and wooden architecture and has been given the following annotation: “Lillehammer Folk Museum, Norway. A stool with three legs, made of a piece of wood resembling a snake. ?+” The question marks multiply in these annotations. Most of the boxes are indexed with speculations as to what volume of the 10,000 years of Nordic Folk Art series Jorn had in mind for the selection. The word “possibly” occurs very often: “Hunters’ art. Possibly Antiquity volume 1”. 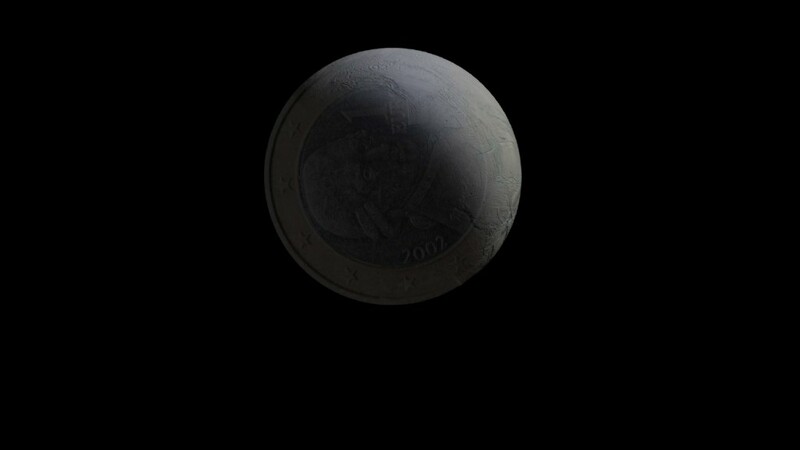 The indexing remains hypothetical, a series of speculations. For us there is something attractive about being able to archive according to hypothetical connections (this is typically what you would want to avoid when setting up a relational database). At the same time, these annotations can be seen as problematic in the sense that they have been made with the book project as sole interpretative grid, with the presupposition that all the orderings can be explained with reference to that project. This raises the tricky question of whether the SISV can be reduced to the Nordic book project only. This is a widespread assumption, held by, for instance by the art historian and former director of Museum Jorn Troels Andersen, who has engaged deeply with the archive over the years and even published six volumes based on Jorn’s maquettes. But what then, do we make of all the images from Spain, France and Italy? Are they not related to the SISV? In addition, the filing cabinet contains 39 albums with images sorted according to motifs. They include images from the SISV repository as well as from other sources (museums etc.) and date from around 1970 (they were taken to the archive from Jorn’s house in Colombes after his death). These images are by no means restricted to the Nordic sphere. Are these orderings unrelated to the SISV project? NH: I wonder if you think it is possible to conceive of Jorn’s conceptualization of the archive in relation to his proposed publication series of 10.000 Years of Nordic Folk Art in terms of an apparatus and a manual? What would that imply? 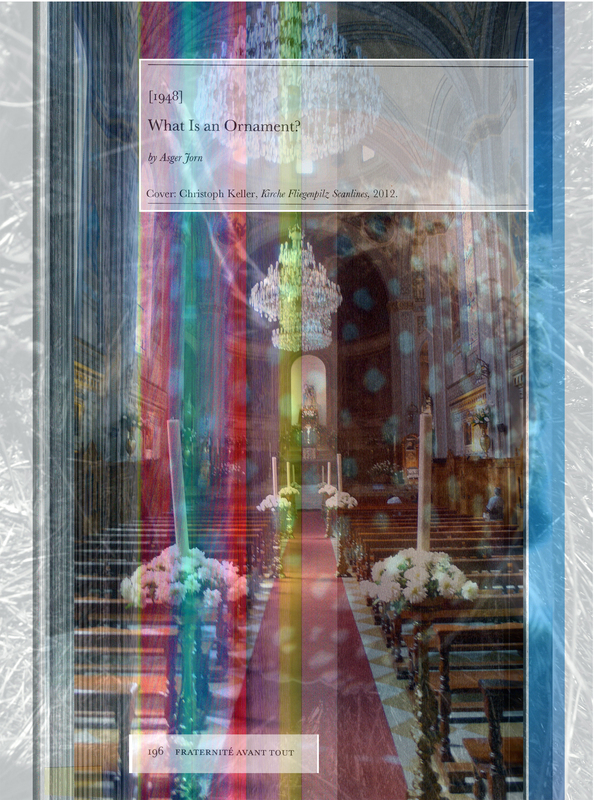 EP: Your questions suggest an intriguing reversal: the image articulations based on the photographic repository preceding it somehow working its way into the latter’s structure, reordering it as its operative manual. Interestingly, such a movement, where a particular use of an archive would feed back into it and transform it is exactly what this archive cannot accommodate. It is significant that whereas you can always trace an image back from one of the boxes or albums to the “archive proper” (the filing cabinet) by means of the code written on the back of most prints, it does not work in the other direction. Looking up an image in the filing cabinet will not point you in the direction of its previous use, whether it has been selected for one of the boxes/albums or appeared in books etc. 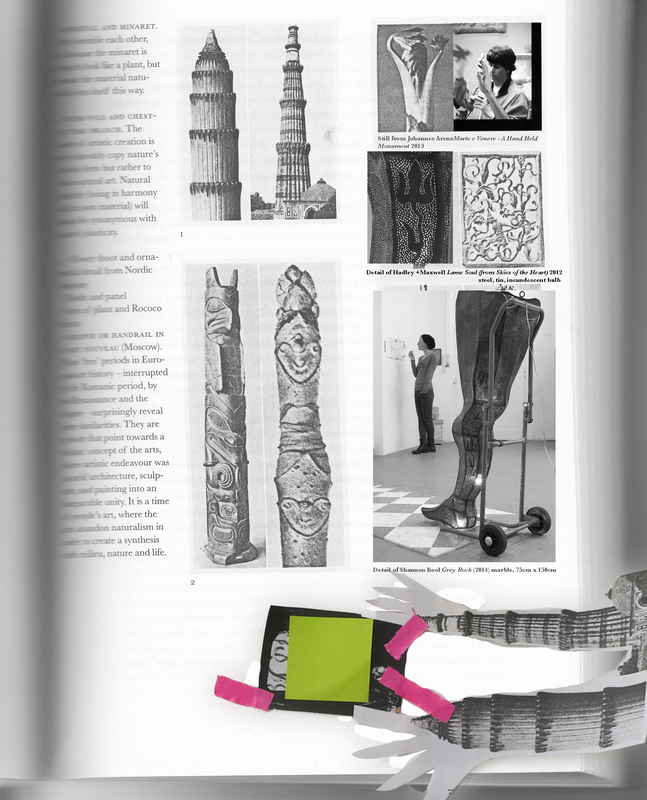 A book such as the one on the stone sculptures of Scania can only work its way back into the archive as a new document, given a unique location in the archive (indeed there is a folder in cabinet 7.4 containing most of the images selected for the book as well as documents specifying their sequence in the book). On another level, the sequences and selections developed by Jorn do serve as suggestions as to how the images in the repository might be handled. As such they are perhaps better described as examples rather than manuals in the strict sense. Jorn explicitly made clear that his orderings were not definitive or exhaustive. In one of the texts you translated for October magazine, he states that “the publication of the series “10,000 Years of Nordic Folk Art” should be a historic event in itself, in the most proper sense of the term, meaning a temporally limited phenomenon that could soon be replaced by another series, composed in a different way” (Structuralism and suppression, 1967). Also, and even more interestingly (not least for the SISSV! ), he ended the 1965 annual report of the SISV (where he announced the temporary closure of the institute) by claiming that the book series “never had been of central importance to the SISV, whose material is primarily meant for other purposes”. In part this may be seen a rhetorical move in the light of the book project’s failure, but I believe there is more to it. To reiterate, I don’t see the work of the SISSV in terms of creating an operative manual to the archive. Understanding how the original apparatus works was rather the starting point for experimenting with new ways of operating the archive, this time with digital tools. If the strength and weakness of the analogue archive is the rigidity of its structure, a digital archive can perhaps let different orders co-exist in a more flexible and dynamic the way. New articulations can work their way back into the archive and become new structures. “My method is systematically in-konsequent and non-cronologic without other determinations and conclusions except the choice of subject and what eventualli comes out of the puzzle. Some peaces comes to fit together and make groups of relations and perhaps more general visions comes out of it, or perhaps not. So my questions have only the scope to force you to break up my combinations if you see that they are wrong, and put them together in another way if you see a combination, or if you have some pieces to join. It is a game. 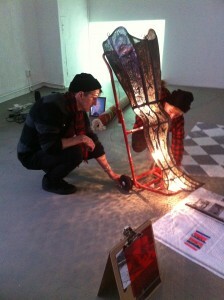 You don’t know exactly what comes out.“ How would you see the relationship between apparatus and manual? I would be interested in hearing more about your understanding of Jorn’s concept of history as related to a kind of “operative vandalism”. NH: I very much enjoyed reading about your research on the historiography of the SISV archive. What I wanted to propose by the terminology of apparatus and manual was the idea, which you seem to share, that the archive might have been conceived as a device facilitating other projects and uses than “10.000 Years of Nordic Folk Art.” On the one hand, the failure to preserve the key for the cataloging system, which in any case seems provisional, indicates a lack of interest in the potential for outside use. On the other hand, the deficiency of the cataloging system imposes the necessity on each inroad into the archive of defining an order anew. Thus, each sequence composed from the archive becomes a model for the understanding of the entire repository. Finally, I wonder whether the setup of the archive and its use, as I have proposed to understand it, might also apply to the kind of ‘reader’ experience that Jorn envisioned for the recipients of “10.000 Years of Nordic Folk Art.” On the dust jacket of 12th Century Scanian Stone Sculpture Jorn quotes five different ordering systems, one of which is described as “more or less coincidental.” Thus, the extent of the visual sequences counting hundreds of images, and the inconsistency of their ordering, emulate the characteristics of the main archive repository, only on a smaller scale. This, of course, speaks against the notion of a steadfast division of apparatus and manual, since the “readers” would have to define their own conceptual frameworks, just like the potential users of the larger archive. The idea of an apparatus and a manual is, however, still appealing to me, if for no other reason then because of its implication of active involvement. 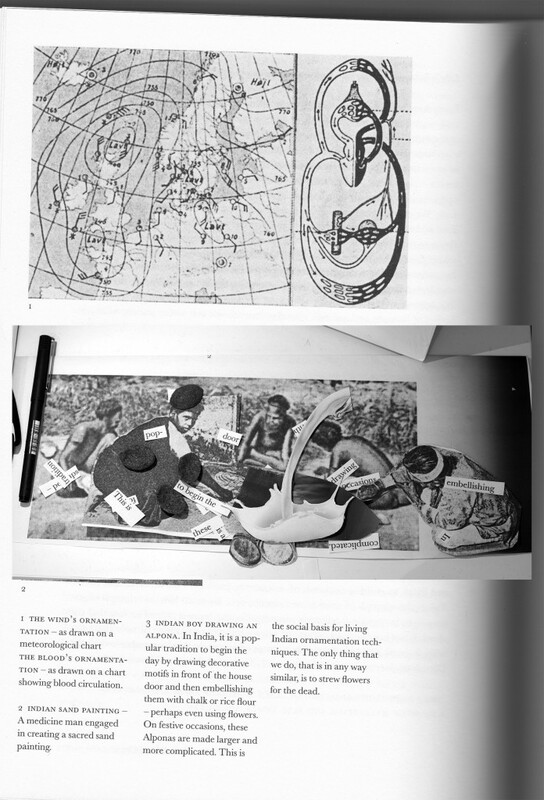 EP: I am curious to know how you see the relationship between the image repository and the book series on the one hand, and the paperback reports of the SISV on the other. The connections are by no means obvious! In short, how should we understand the relationship between the material technologies of memory (negatives, paper, inventory, archive etc.) and the theoretical, historical and speculative “superstructure” of the SISV as an engagement with the past? NH: If you look at Jorn’s “Postscript” in 12th Century Scanian Stone Sculpture, which was published as a pilot for the proposed “10,000 Years of Nordic Folk Art” book series, Jorn frames his project as an archaeology as opposed to a history. 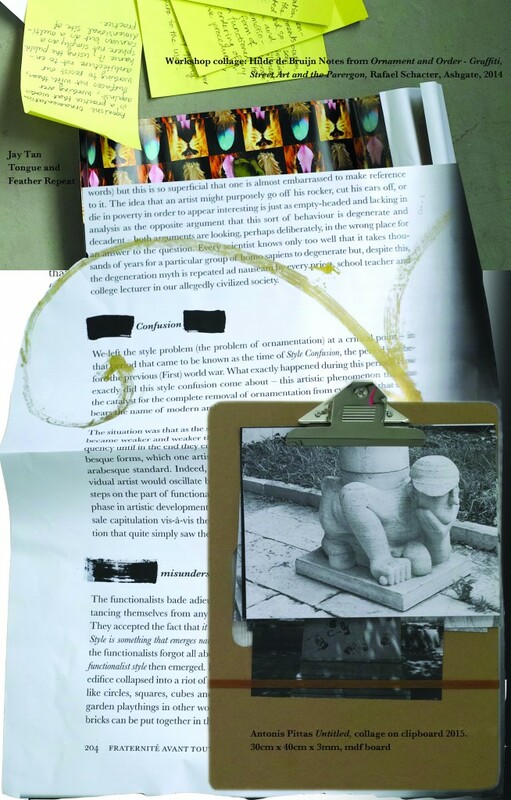 He defines archaeology—by contrast to history’s tracing of “actions and events”—as the development of “the most ordinary types” in a stratigraphic overview of “…the homogeneity and variation of repetitions.” In addition to archaeology, Jorn defines his project within a terminology of vandalism, adapted from the literature on the destruction of art. Vandalism denotes the research focus on graffiti, heathen iconography in Christian churches, and folk art, but also Jorn’s “archaeological” approach to that object field. Thus, the definition of vandalism does not distinguish between visual production and interpretation. 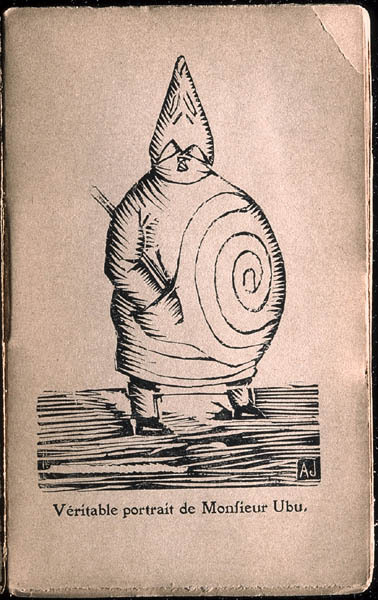 In that, Jorn’s vandalism reminds me of the Situationist strategy of détournement, described by Tom McDonough as borrowing in equal part from Bertolt Brecht’s Umfunktionieren and Lautreamont’s plagiarism. The notion of a logic of appropriation posed between deliberate critical re-inscription and anarchic attack on the integrity of authorship and singularity of events, I think, also applies to Jorn’s concept of vandalism. Both détournement and vandalism are based on the idea that the construction of the present relies on the simultaneous creation and destruction of the past. 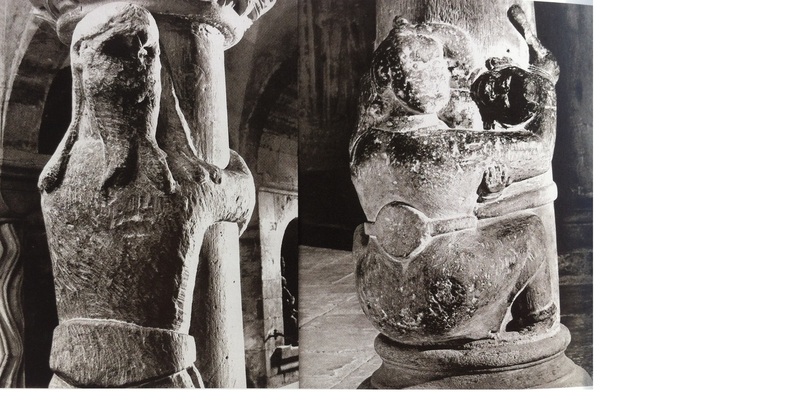 I think of the sequence of 12th Century Scanian Stone Sculpture as a reflection of Jorn’s interest in the inherent destructiveness of history writing, or archaeological excavation for that matter. The excessive repetition of similar motifs in the sequence overreach all pedagogical utility and seem more in the vein of Lautreamont than Brecht. My interpretation of Jorn’s vandalism may seem to some to be too generous in its assessment of the criticality of his project. 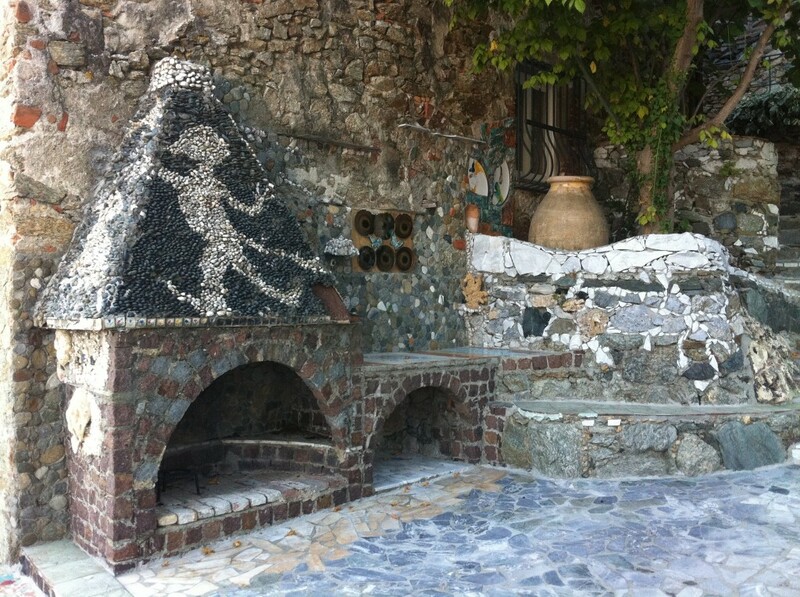 At the same time as Jorn’s vandalism is full of vestiges from his involvement with the Situationist International, the rhetoric of a specifically Nordic or Scandinavian vandalism or barbarianism suggests the notion of a recourse to a primal origin that dates back to the Cobra years, and which is contradictory to the vandalist archaeology as I have just outlined it. Asger Jorn: “Postscript to 12th Century Stone Sculpture of Scania” . October 141 (summer 2012), pp. 73-79. Translated from the Danish by Niels Henriksen. Asger Jorn: “Structuralism and Suppression” . October 141 (summer 2012), pp. 81-85. Translated from the Danish by Niels Henriksen. 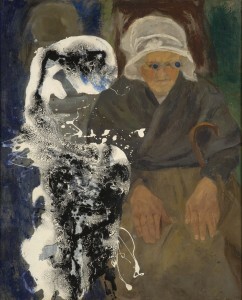 Niels Henriksen: “Vandalist Revival: Asger Jorn’s Archaeology”. In Asger Jorn: Restless Rebel, eds. Dorthe Aagesen og Helle Brøns (Statens Museum for kunst, 2014), pp. 226-237. A book about the SISSV project, with essays by Teresa Østergaard Pedersen, Matthew Fuller and Éric Alliez, is forthcoming in 2015. [i] An affordance is often taken as a relation between an object or an environment and an organism, that affords the opportunity for that organism to perform an action. 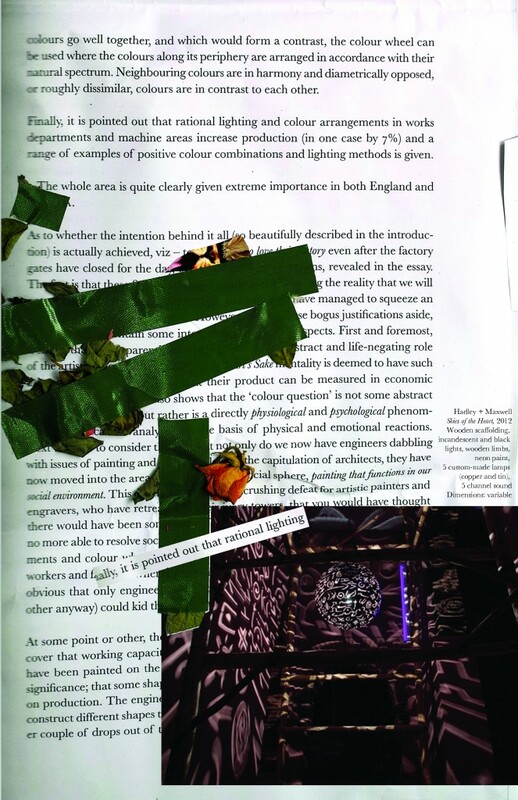 Participants in 'Comparative Vandalism' at Officin: Books, Paper, Prints, Copenhagen, July 2014. Søren Andreasen, an artist based in Copenhagen. 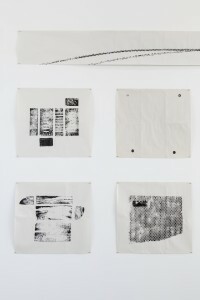 Andreasen often makes drawings, etchings and works using a range of printing techniques. He has published several books and written a series of pamphlets. The combination of abstract images and texts about art, its politics and relationship with everyday social situations plays a vital role in his work. He is essentially interested in the way art affects the way we think and behave. Helle Brøns, a PhD candidate at the University of Copenhagen, Statens Museum for Kunst, and Museum Jorn. Author of Asger Jorn, Copenhagen 2009, “Masculine Resistance. Expressions and Experiences of Gender in the Work of Asger Jorn”, in October: Asger Jorn: A Special Issue no 141, 2012 and “The Shock of the Old,” in Hvad Skovsøen gemte. Jorn’s Modifications & Kirkeby’s Overpaintings, Museum Jorn, Silkeborg, 2011. 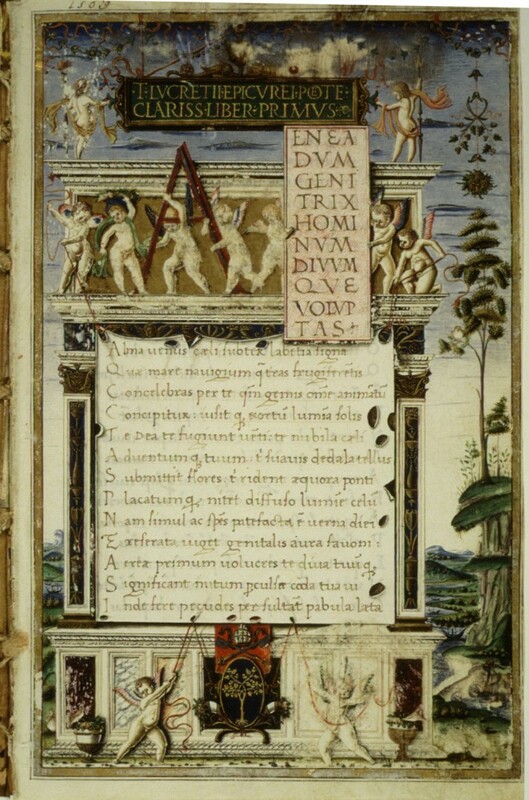 Louise Hold Sidenius, who runs Officin – Books, Paper and Prints. Together with Marie Kølbæk Iversen she also runs the Danish editorial project Internationalistisk Ideale. They recently made a print and video display focusing on Jorn´s publication “La Langue Verte et la Cuite” from 1968, known in Danish as ‘tungebogen’ – the ‘tongue book’ and a wall installation with cut-outs from the book generating a new visual narrative. Teresa Østergaard Pedersen, an art historian with a background in medieval art and archeology, a former curator at Museum Jorn and currently a PhD candidate. For her PhD she is taking Asger Jorn’s theories and extensive photographic archives on pre-Christian Scandinavian images as a starting point for her re-evaluation of the narrative constituting Scandinavian Visual Culture in the contemporary archeological and art historical fields. 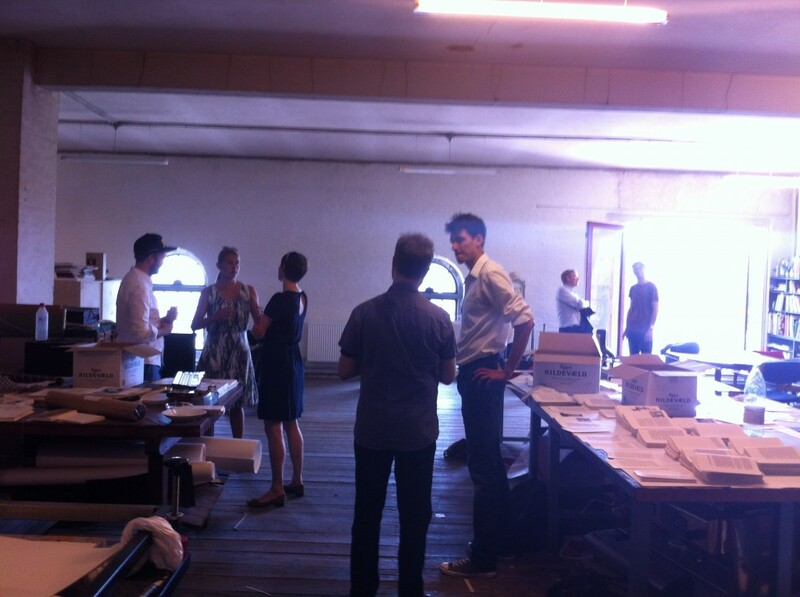 The afternoon of exchange took place on Sunday 6 July at Officin: Books, Paper, Prints in Copenhagen. Within the framework of my research into Asger Jorn´s writing and thinking I organize public sessions with special guests at a variety of venues. The guest´s practice, knowledge, insights, or responses are informative to my research, or steer the direction I take on a particular topic. The sessions also often respond to the context of the hosting institution, or to a specific request. Making the sessions public is a way to share and enter into a dialogue with the audiences. ‘Thinking Through Matter’ was a talk by myself and Copenhagen-based artist Ferdinand Ahm Krag in the framework of the exhibition ’Asger Jorn – Restless Rebel’ at the Statens Museum for Kunst, Copenhagen. The talk took place Saturday 22 March 2014. Both my introduction and Ferdinand Ahm Krag’s contribution find their starting point in Asger Jorn´s text ´What is an Ornament?’ from 1948. In this text Jorn states that ornamentation is to be found in all matter, that ornamentation is “the grammar of substance”, “the geometry of life” itself. Illustrations in Jorn’s text include a representation of the orbital paths of a radium atom, and a representation of the earth’s rotational curves within its phases of movement. They serve to stress his idea of the ornament as “spontaneous arabesque”, a type of ‘moving’ and hence dynamic ornamentation that is natural and about organic cohesion. My text introduces these ideas (a different version though from the session ‘The Grammar of Substance’), and serves as a support to join in Ahm Krag’s thinking about what it means to be ‘natural’ and have a ‘natural’ relationship with materiality in our current times, the age of the anthropocene – the human-made geological epoch. You can find my introduction in the blog entry ‘Thinking Through Matter I’. In his text ‘What is an ornament’ Asger Jorn describes the ornament as the formal language of nature. Different elements interact in such a way that it becomes ‘ornamental’: think of the patterns the wind and the clouds create. On a micro scale Jorn finds the principle of ornamentation inside the atom. But how far does the principle of ornamentation reach? When does it stop to relate to the human world? 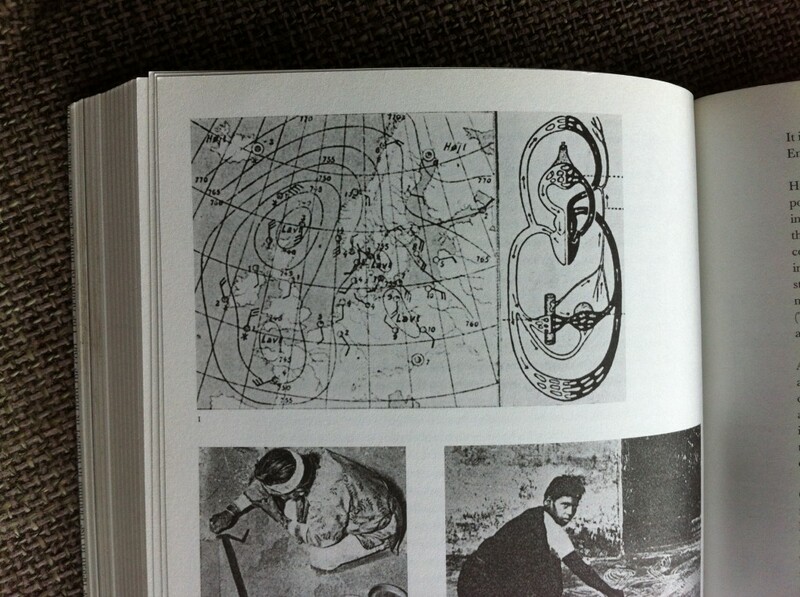 In relation to Jorn’s text I am particularly interested to try and locate the outer boundary of the ornament. How far does it stretch? So let us look at the figure of the ornament as a way of assembling a cosmology. Matter builds up into solar systems that build up into galaxies that build up into clusters and superclusters, and at the very largest scale we find the filament-structures of visible and dark matter – the overall superstructure of the known cosmos. The ornament of matter at the largest scale. Does the natural ornament of matter at a certain point leave the human being behind – and where exactly is this point? And where should we position Asger Jorn in all this? Does he stay within a human centered world? 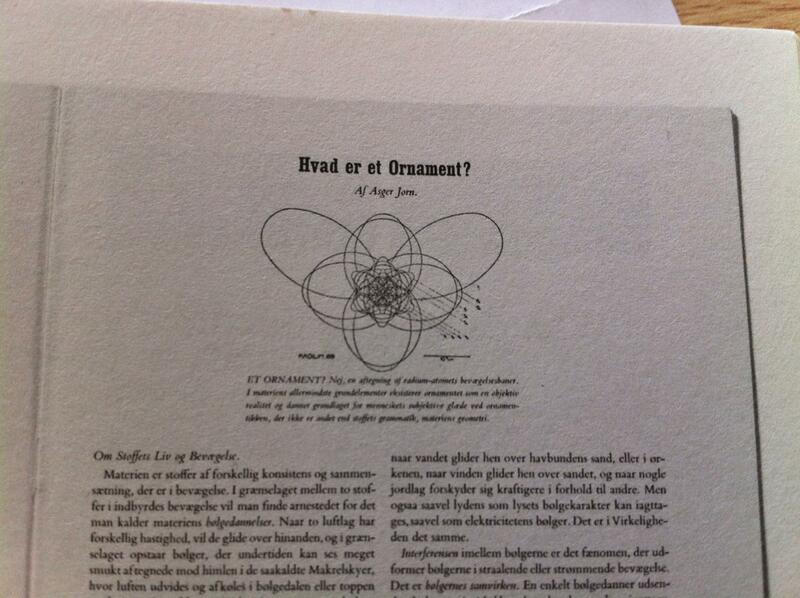 One could wonder why there are no images of spiral galaxies in Asger Jorn’s text ‘What is an ornament?’ Asger Jorn never leaves planet Earth. It’s from the ground that he looks up and observes the patterns of the clouds and the weather. Today the weather has become climate and the topic of climate change. 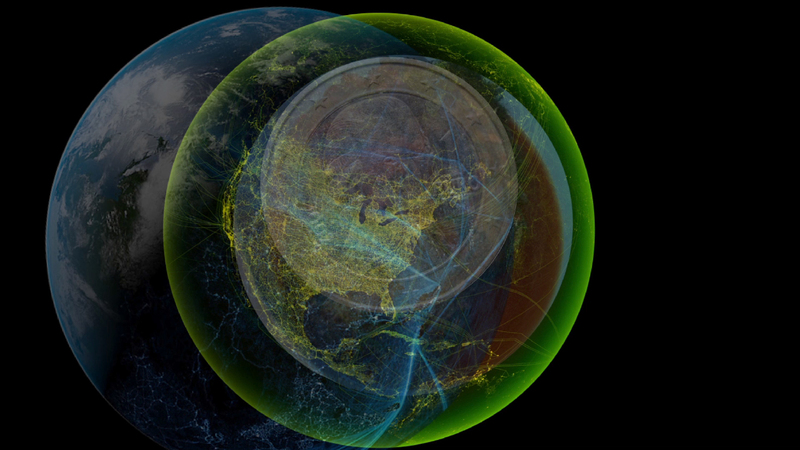 Climate models always envision the globe seen from outer space. From some thousand kilometers above ground, where there is no gravity. 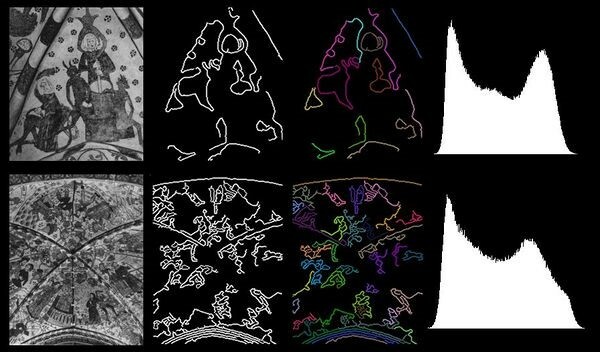 Climate models place us in an imaginary space outside earth and this positioning of ourselves outside earth trying to monitor the climate is made possible by the interior workings of computers. 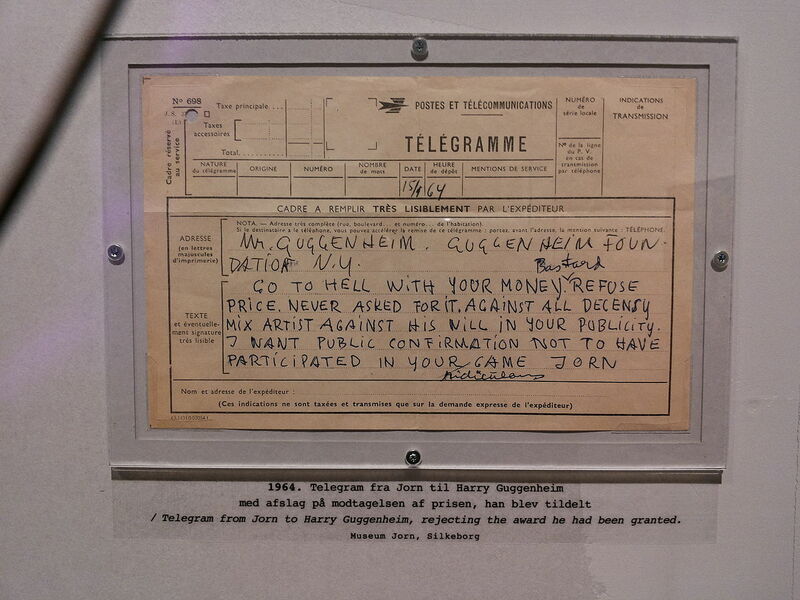 Asger Jorn stays on ground – he stays grounded. 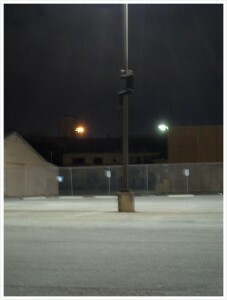 But he inhabits the ground in such a way that it seems to be infinite in all directions. For those of you who have seen the movie ‘Gravity’ – that just won seven Oscars – you will know that the film starts with the following statement: LIFE IN SPACE IS IMPOSSIBLE. ‘Gravity’ is about an astronaut – Dr. Ryan Stone – trying to fight her way out of space and back down to earth. It’s a sort of reversed science-fiction: It’s not about expansion out into Space. It’s about getting back down to earth. Getting grounded and gaining gravity. It is called ‘re-entry’ when a space-shuttle comes down the atmosphere from outer space. 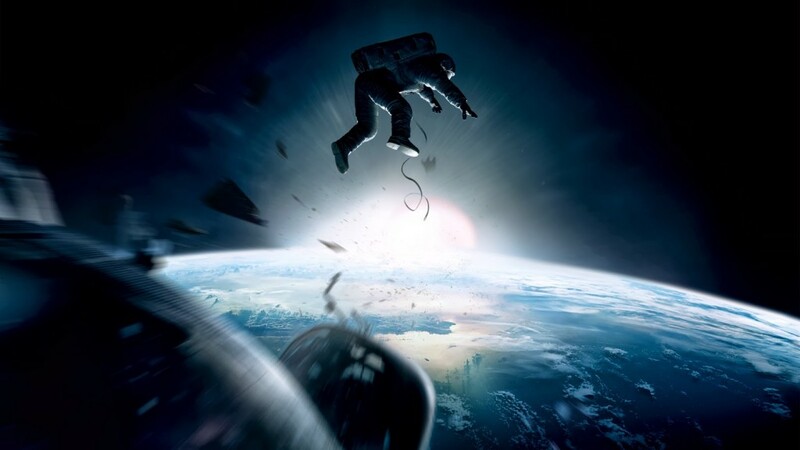 If the film ‘Gravity’ reflects the changing mental state of a culture that now is in the process of a re-entry – a re-entry to the planet and the materiality that makes up the planet, then the question is: what ground are we re-entering? Is it the same ground consisting of the same materiality as when we – metaphorically speaking – took off from the ground in the beginning of modernity ? If we follow the logic of the film ‘Gravity’ the odd thing is, that it is Earth itself that has become utopia. Not Space. But if it is Earth itself that is the new ´space´ to project our ideals onto, then one might ask: if we are not on earth, then where are we? Apparently we are dealing with this problem of locating where we are? Marx wrote the following famous words in the communist manifesto: “All fixed, fast-frozen relations, with their train of ancient and venerable prejudices and opinions, are swept away, all new-formed ones become antiquated before they can ossify. All that is solid melts into air.” We are now learning that the ‘air’ Marx mentions is not at all a metaphor. This ‘melting process’ of industrialization and of capitalism has been so profound that it has within the last century led to an epoch-scale crossing of a geological boundary. The starting point of the Anthropocene is set in 1950 by geologists. Jorns text ‘What is an Ornament’ is from 1948 – an interesting coincidence. I would like to bring up one of his interpretations of the ornament again: “The ornament as spontaneous arabesque, which manifests itself as a set of elements within a greater whole. This is ‘moving’ and hence dynamic ornamentation. It is about organic cohesion”.It is my strong feeling that Asger Jorn´s thoughts on the ornament and ornamentation – in some updated version – could be a powerful and necessary contribution to the urgent task of assembling an ecological thought that is not grounded in the Holocene, but instead in the strangely disrupted world of the Anthropocene that goes beyond all former notions of the natural world. I will now show a video that I recently made and which is partly inspired by Jorns thinking about the ornament. But it also differs a lot from his thinking. My work does not really deal with `organic cohesion`. Instead it is about “digital cohesion”. 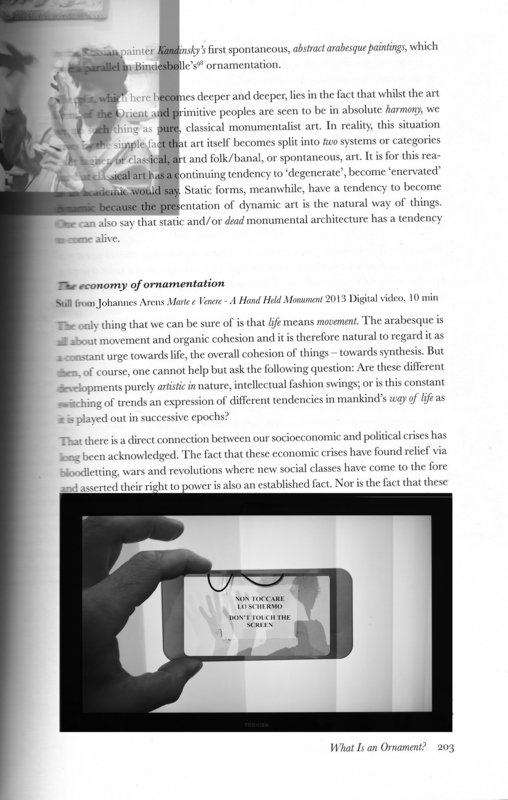 It is a kind of spontaneous digital primitivism. And the question is – for later discussion – if there still is such a thing as “organic cohesion” that can be used as a model for a materialistic cosmology? How do “organic cohesion” and “digital cohesion” relate to one another? June 5th, 2014, posted in Public Sessions and Lectures, What is an Ornament? ‘Thinking Through Matter’ was a talk by myself and Copenhagen-based artist Ferdinand Ahm Krag in the framework of the exhibition ‘Asger Jorn – Restless Rebel’ at the Statens Museum for Kunst, Copenhagen. The talk took place Saturday 22 March 2014. 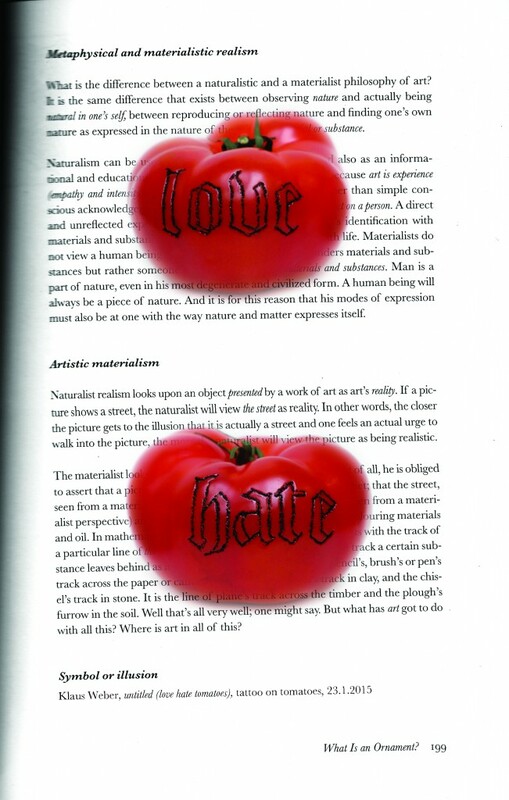 My text introduces these ideas (a different version though from the session ‘The Grammar of Substance’), and serves as a support to join in Ahm Krag’s thinking about what it means to be ‘natural’ and have a ‘natural’ relationship with materiality in our current times, the age of the anthropocene – the human-made geological epoch. 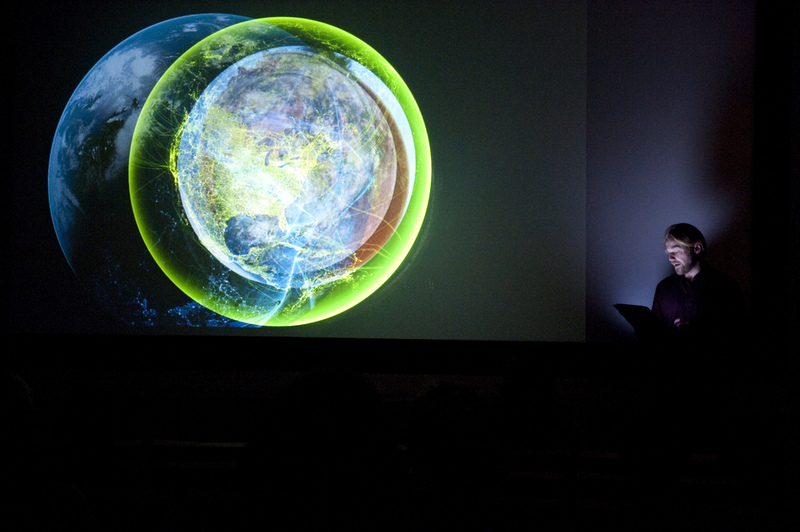 You can find Ahm Krag’s talk in the blog entry ‘Thinking Through Matter II’. 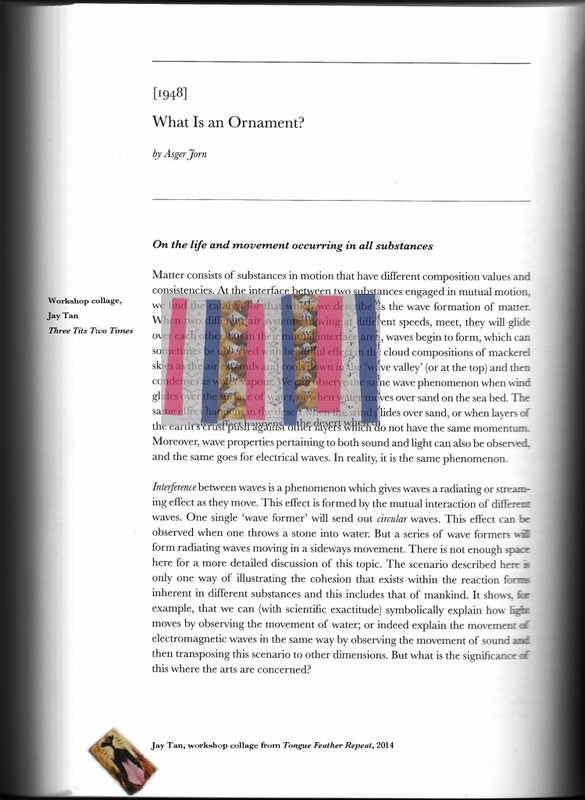 Jorn wrote the article ‘What is an ornament?’ in 1948. The text was up to a large extend stemming from Jorn’s critique on the predominant functionalist architecture of the time. 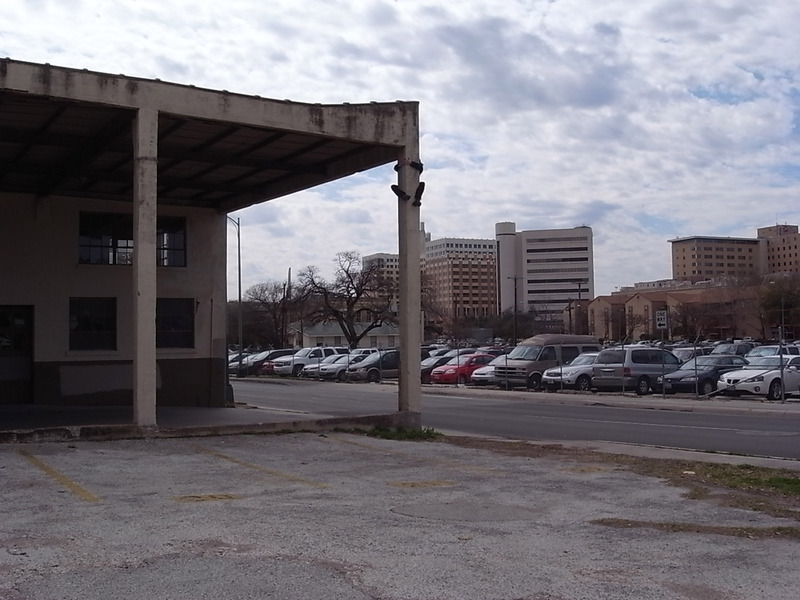 Functionalist architecture, roughly said, means that the design of a building should clearly reflect its purpose. In the area of ornamentation this also generally implied that features which are not necessary for convenience, construction, or propriety, were not desirable. The ornament as monumental decoration which seeks to form a finite whole, and becomes static ornamentation. The ornament as spontaneous arabesque, which manifests itself as a set of elements within a greater whole. This is ‘moving’ and hence dynamic ornamentation. It is about organic cohesion. Examples of static ornamentation are: classicist Renaissance art, and various forms of neo classicism. Dynamic ornamentation is to be found in the art forms of all primitive people, art of the Orient, and prehistoric art – until Romanesque monumentalism set in. From that moment on says Jorn, there has been a constant reappearance and disappearance of dynamic ornamentation: Baroque, Rococo, Empire Style, Art Nouveau. Jorn connects the appearance and re-appearance of both static and dynamic ornamentation to economic and political changes – static ornamentation belonging to classical art, the language of the ruling class, and dynamic ornamentation belonging to spontaneous art, belonging to the people. He also notes that static forms have a tendency to become dynamic because dynamic art “is the natural way of things”. There is however much more to be discovered about Jorn’s text than categorization of ornamentation, or the defence of ornamentation in a critique of functionalism. In fact, the very first point that Jorn makes in ‘What is an ornament?’, is that “Matter consists of substances in motion that have different composition values and consistencies. At the interface between two substances engaged in mutual motion, we find the catalyst for that which we describe as the wave formation of matter.” Think of wind-clouds, wind-sand, sound-light etc. He importantly adds that “this cohesion that exists within the reaction forms inherent in different substances, includes that of mankind.” Jorn illustrates the idea with several images. Jorn’s caption with the first image is: “A Flower? No, a representation of the earth’s rotational curves within its phases of movement. In every aspect of matter from the smallest atom to the whole universe, we find the same pattern of movements as those created, not just flowers but mankind itself. Everything is reflected within everything else. The second image shows a cross section of the human muscle with right next to it, a map of a town in the Middle Ages. 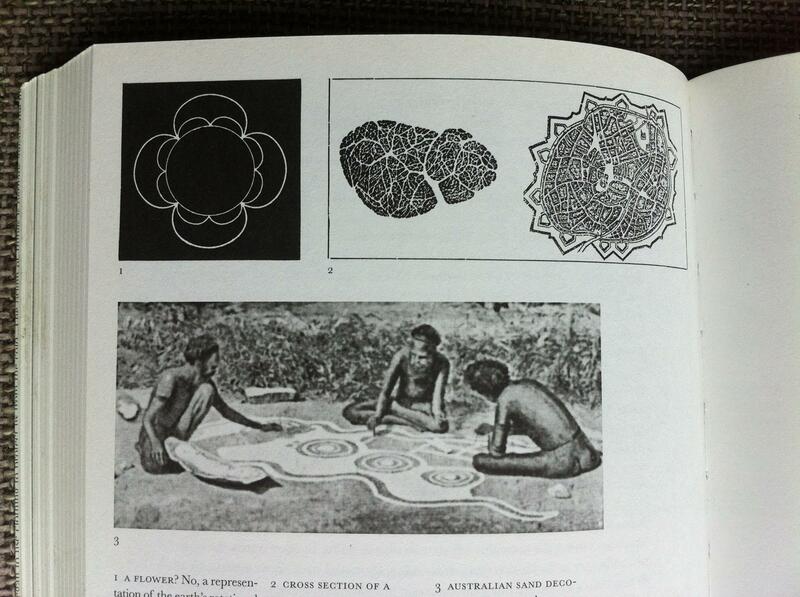 The third images says ‘Australian sand decoration’. The fact that Jorn in both ‘What is an Ornament’ and in ‘Living Culture’ starts out defining the ornament as “the grammar of substance, the geometry of life itself”, is indicative for how much the examination and negotiation of the relation between the materiality of the art work and its discursive meanings, between matter and mind in general, meant to him. These issues were of crucial importance in Jorn’s practice. I will discuss his materialist(ic) attitude to life, and would first like to mention art historians Helle Brons and Graham Birtwistle, as their writings which have been very informative to this. Jorn’s theory of materiality is inspired by thinkers such as Karl Marx, Susanne Langer, Gaston Bachelard, and Niels Bohr – all of whom emphasized – in different ways – the role of physical matter in human thinking. Despite the fact that Jorn was also very critical of some of their ideas, they built an important basis for his own thinking, or re-thinking of matter. This includes thinking about art not as something derived from an ideology or world-view (as Marxist art theory and aesthetics often suppose) but thinking of art as the direct expression of an attitude to life, and as belonging to the fundamental level of work and production. At the basis of his thinking is also the relationship between the visual, the material and the semantic (On an artistic level this means that Jorn’s aim was not a purely visual or material art, but “a recognition of these aspects as meaningful in itself before the discursive level”, as Helle Brons puts it in her paper ‘Material Meanings’), and not in the last place it also includes the thinking of the agency of material matter, the idea that the material world cannot be seen as passive, pre-shaped objects waiting for active subjects to observe and describe. It has its own agency and is constituted partly by its own force and partly by the way we perceive it. In ‘What is an ornament?’ Jorn expresses this idea the following way: For the materialist artist, “human thought processes are instigated by the substances themselves, and are synonymous with the reaction form which these substances have, because thought (…)cannot avoid the natural laws pertaining to matter. For the material artist, nothing (not even thought processes) can be immaterial in the deepest sense of this word.” In another text, ‘Magic and the Fine Arts’, Jorn also speaks of the identification with things, the identification with matter, when he discusses the importance of play in art and life, and defines play as “the fundamental element in art, the unconscious active enjoyment of life through play with matter, with colours, tones, clay, words etc. (…) Play is not consciously directed to any goal but is a delight, an identification, with things themselves.”(see Birtwistle, p. 76). Birtwistle also goes into the influence of nineteenth-century Swedish poetry and other nineteenth-century (Romantic) thinkers on Jorn’s view of (material) life as essentially harmonious. Jorn: “nature, in distinction to class-society is not static or determined by conflict or dualistic but quite the opposite: it is dynamic and harmonious.” (Birtwistle, p. 61) summarized Jorn’s perspective the following way: “Man’s original sense of unity with animal life has been changed to enmity as a result of class-society and its warped values, so that the concept of animality has come to be associated with diseased and decadent human actions rather than with authentic natural values”. In ´What is an ornament?´ Jorn clarifies what it means to be a materialist artist and states that “the materialist acknowledges that as a human being he is part of the materials and substances, can not be separated from nature.” With remarks like these, Jorn’s approach to substance and the material world at times seems remarkably non-hierarchical. This attitude is not only expressed in words, but also in his works, be it in the way he dealt with the materiality of the work, or with the subject matter. In Jorn’s view, man is not only part of the organic world, man is also an animal, and “subject to the laws the whole organic world has in common.” This rejection of a pure humanist perspective, the idea that we stand above the animal world because we are rational, had much to do with the direct experience of World War II. Jorn, and many of his fellow artists at the time, felt that the experience of (two subsequent devastating) wars had proved this idea to be false. Jorn believed that there is an animal side in humanity that can’t be controlled and also doesn’t want to be controlled. “(…) The human being’s changing of natural forms and natural sequences has evolved with incredible speed, and will result in nature, as it functioned before human intervention, being replaced by a new nature.” And a furtheron he says: (…) This utilization of the tool is the point of departure for human art, culture and technique, and creates an opponent relationship between nature in and around us and our wider modes of action. We came into conflict with the whole order of nature. I would say though that Jorn himself definitely lived up to his own ideas on materiality and his ideas on a new type of ‘realism’ in art (that is more in synch with the ‘natural’) while re-building two small ruined houses that he bought in the municipality of Albissola, Italy, where he lived on and off from the mid 1950’s to his death in 1973. Here, he put his idea of ‘a living art’ into practice, resulting in a situation in which art, architecture and nature merge into what Guy Debord came to call Jorn’s “architecture sauvage” (wild architecture). I would like to link Jorn’s eye for and celebration of “the vibrancy of life” to contemporary thinking about materialism. Philosopher Jane Bennett for instance stresses the urgency to rethink “the idea of matter as passive stuff, as raw, brute, or inert” in her publication ‘Vibrant Matter – a political ecology of things’ from 2010. Vitality, the key word in her book, is explained by her as “the capacity of things – edibles, commodities, storms, metals – not only to impede or block the will and designs of humans, but also to act as quasi-agents or forces with trajectories, propensities, or tendencies of their own.” In the book she challenges the notion of a world divided into ‘dull matter (it, things)’ and ‘vibrant life (us, beings)’, and points at the vitality of matter and the lively powers of material formations, such as the way omega-3 fatty acids can alter human moods or the way our trash is not “away” in landfills but generating lively streams of chemicals and volatile winds of methane as we speak. Bennett advocates a revision of the classical notion of ‘ecological’ needs. We should no longer focus on for instance stable interdependencies between species, but think of ecology (and consequently of politics) in a more ‘vitalist’ sense that de-privileges humans. 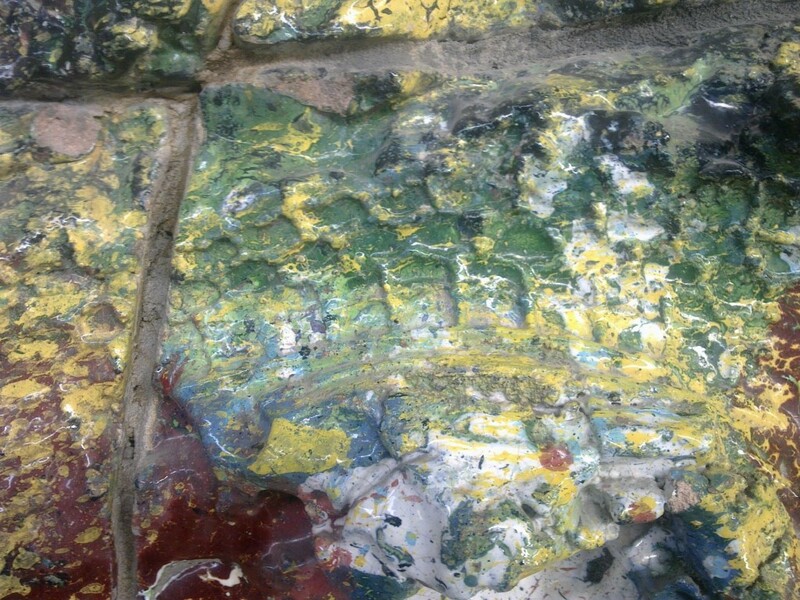 Jorn’s ‘new nature’ is currently described as no less than a whole new geological era, the antropocene. 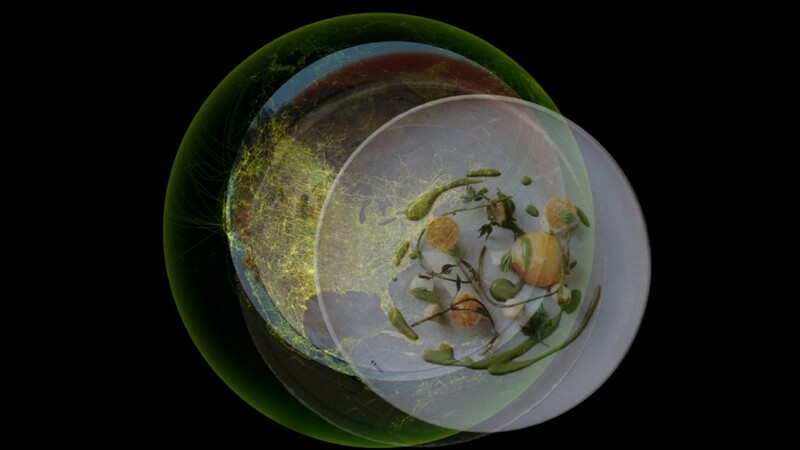 In the blog entry ‘Thinking Through Matter II’ Ferdinand Ahm Krag talks about what it means to have a ‘natural’ relationship with materiality in this human-made geological epoch. ‘The Grammar of Substance’ was a talk by Canadian artist Shannon Bool (lives and works in Berlin) and myself in the framework of the exhibition ‘Shana Moulton – episodes from Whispering Pines’ at Nieuwe Vide, Haarlem. The talk took place on Sunday 16 March 2014. In the blog entry ‘The Grammar of Substance I’ you will find a brief description of Jorn’s text ‘What is an ornament?’ (1948). 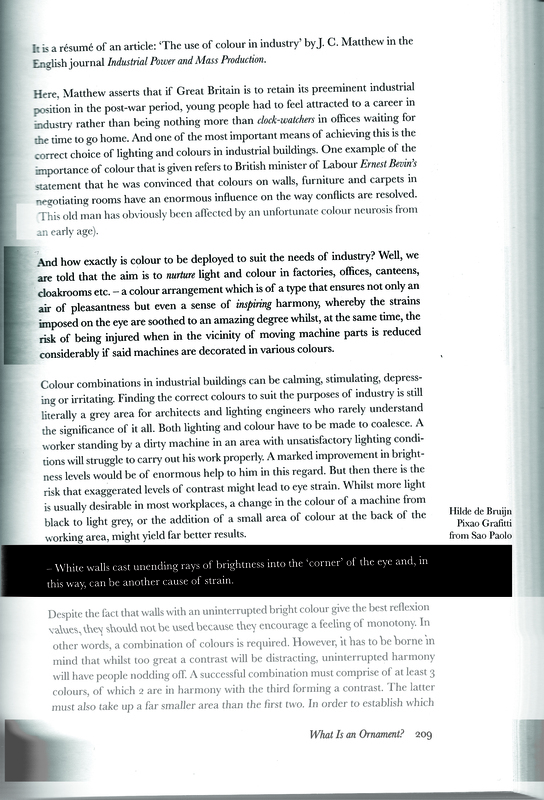 In her contribution to the talk, Shannon Bool looked at this text from the perspective of the discussion of high and low of in the late 1940’s, and then makes the jump to today, where “Jorn’s categories of ornamentation have merged and artistic strategies require the skills to extract ornamentation from functionality.” Bool also specifically discussed Shana Moulton’s strategy of synthesizing contemporary banality, and specific objects as “escape routes” or catalysts. What is most striking to me about Jorn’s text ‘What is an Ornament’? is the way that the text seeks to define ornament from a descriptive or functional viewpoint, but outlines a more universal, or even cosmological description of how ornament pervades the natural world, on the level of physics, wavelengths, and geography. It encompasses both macroscopic and microscopic examples of natural phenomena that act as a sort of blueprint for the human’s need to ornament. I am an artist who works with some specific aspects and examples of ornamentation, often by subverting the context of cultural information or using unlikely material processes to paradoxically take a deeper reading into surface). Hence, I am primarily interested in some of the ways that Jorn focuses more on the idea of ornament as a way of existing in the world (i.e. his definition of a materialist artist) rather than an anti-modernist defense of specific ornamental forms. It also interests me to see how Jorn takes a probing look at some of the pitfalls of the functionalism of his time. In this respect, he takes a broader, sociopolitical look at the development of functionalism as the downfall of ornament and uses the birth of modernism, or the period just before WWI and outlines a Style Confusion Period as paving the road for functionalism. I am struck by Jorn’s discussion of “style confusion”, his critique of the multitude of “isms” that emerge in the post war period “cubism, fauvism, futurism” etc, and how he views the avant-garde as inauthentic. He credits the increasing tempo of avant-garde movements in creating a permanent conflict with spontaneous arabesque forms that culminates into the dead end of functionalism. This is an interesting point when one thinks of the “spontaneous arabesque” forms that the avant-garde utilized or even props of these movements. For example the collection and appropriation of ‘primitive’ forms (such as harnessing the energy of primitive masks in cubism), primitive impulses (embracing the transformative energies of war and destruction in futurism) and primitive behaviors (as in “going native” in Fauvism). As I will later point out, this aspect of appropriating spontaneous arabesque is reflected in contemporary use of ornament, just as original sources are explored, or emptied out consumerist examples are explored. 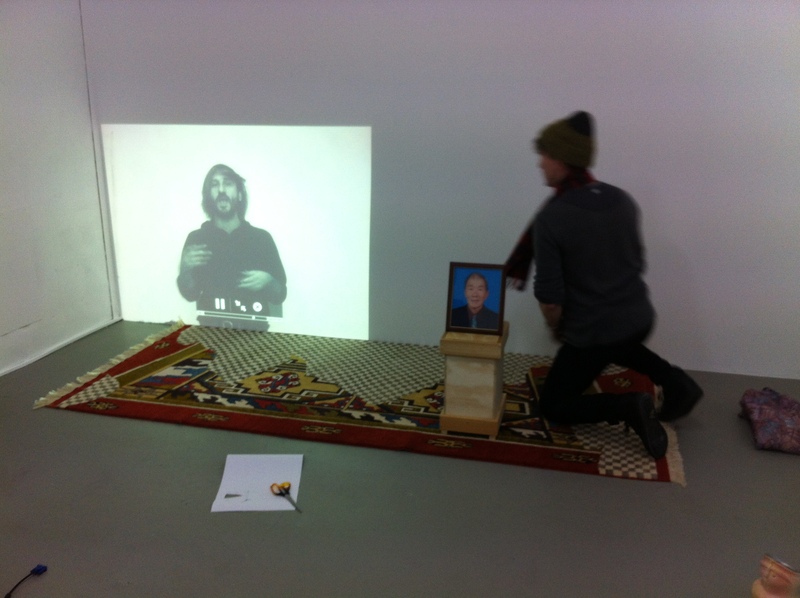 This is also a very present aspect in the video works of Shana Moulton. 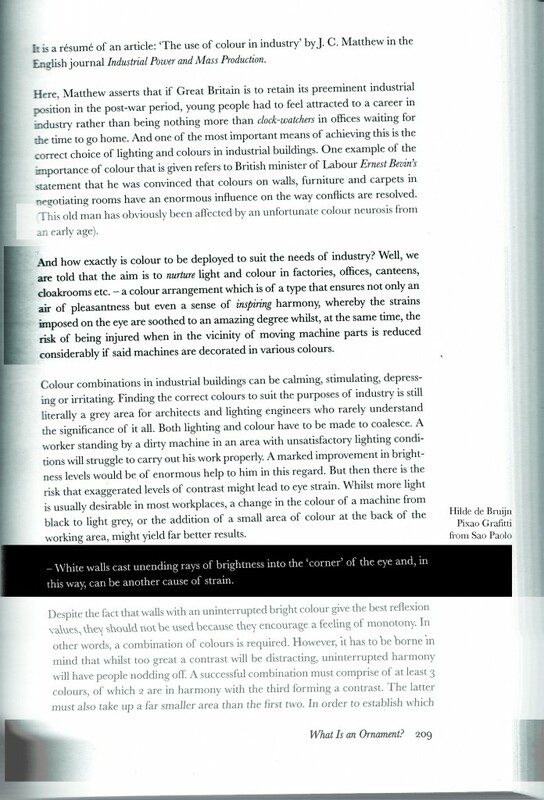 Here Jorn describes the crisis of surface decoration that occurs around the birth of modernism. For me, an interesting aspect of functionalism is precisely this avoidance of style, which places then almost fetishistic focus on certain surfaces, which are not per se “decorative” but carry a tremendous psychological weight. It is almost as if an avoidance of what is “primitive”, or any remnants of “spontaneous arabesque” results in an even more atavistic reality. Adolf Loos, 'Schlafzimmer meiner Frau: Weisse Tünche, weisse Vorhänge, weisse Angorafelle', 1903. Photographer unknown. 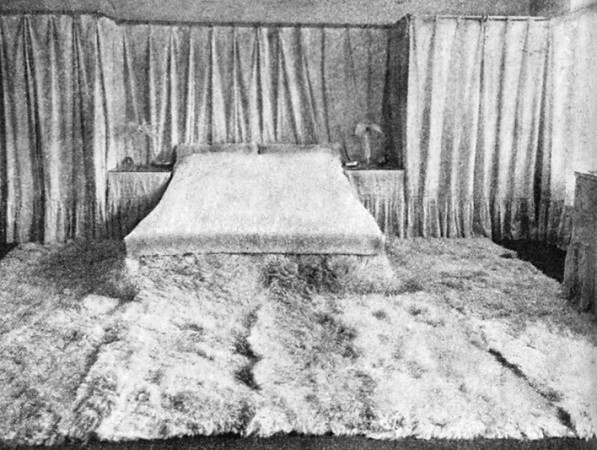 My favorite example of this is an anonymous photo that was taken in 1903 of the room that Adolf Loos designed for his new wife Lena in the apartment that he completely renovated before they were married. The photo, which can only be found in low quality in an Art periodical from Vienna of that year, is titled: “Schlafzimmer meiner Frau: Weisse Tünche, weisse Vorhänge, weisse Angorafelle.” It shows a room completely devoid of furniture or decoration, covered in white materials. Most strikingly, an angora carpet covers the floor of the room and culminates between the beds two mattresses. The room is a great example of how avoidance of decoration can create atmospheric effects that parallel those of Jorn’s “spontaneous arabesque”, in a sort of identification with and empathy towards a constructed space. This space is intended to precisely reflect an inner, organic experience just as “spontaneous arabesque” emerges from an attunement to nature, or from “life’s intrinsic patterns” as Jorn deems. While I understand Jorn’s resistance to the functionalist’s agenda of counter ornamental purification, I can also conclude that at the time his essay was written (1948), many examples of its functionalism can be viewed as decorative today. Looking at this image more than six decades later, it could strike us as decorative, as sort of an adaptation of spontaneous arabesque, because of subtle details such as the sweetness of old fonts, or even the nostalgia they deliver. My point is that where Jorn leaves us in 1948, functionalism evolves into several styles (Postwar practicalism, Scandinavian minimalism with a focus on natural materials, and then the bright colourful explosion of Italian functionalism. I believe, alternatively, that in it’s most basic sense, functionalism provided us with a perfect shell to be slowly filled with the abounding consumerism, mass media and an overwhelming amount of ornamentation which has been appropriated, sampled and referenced from original sources and for the most part, emptied out of its original contents. In Shana Moulton’s videos, the character of Cynthia surrounds herself with knick knacks in a domestic setting that range from the holy artifacts to the most mundane thrift store finds. 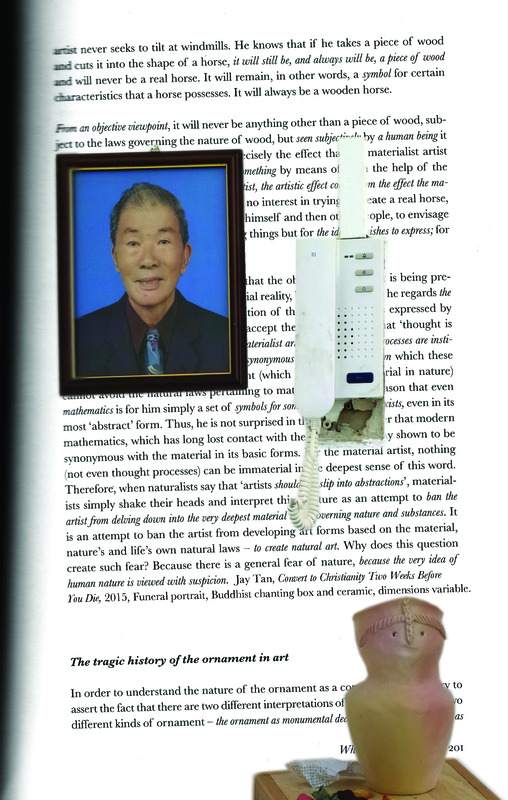 The passage of time has almost equalised the auras and symbolic values of these references. For example, in ‘Whispering Pines #4′ Cynthia’s setting features a copy of Mondrian’s evolution tryptic, which in this setting, hanging over a banal eighties leather sofa, looks like decoration for a medical office. Cynthia herself, wears a housedress normally worn by women over 65 who can be found in the deepest, darkest realms of domesticity. Cynthia’s housedress however, matches her to Mondrian’s channelling and enlightened figures. This non-hierarchal choreography forms a world where Cynthia can attempt to balance the overempathic activity of her senses. This balance ruptures into ecstatic moments when she emphathises with what we could call the “spontaneous arabesque” of certain materials or objects. In the contemporary mix-mash of powerful symbols mixed with emptied out consumerism, Cynthia even subverts the functionality of prosthetic devices and wellness knick knacks. She uses them as raw material to build objects which emulate the earnest origins of „spontaneous arabesque“, such as a ceremonial staff she builds from massage tools and brings to ‘The Antiques Roadshow’ in ‘Whispering Pines #4′. Other mundane objects are used in rituals that seem to balance Cynthia or lend her healing powers. 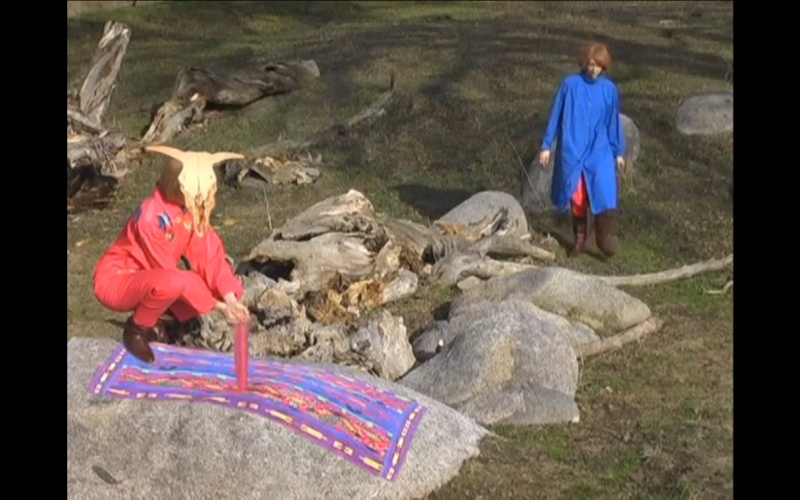 In another video, ‘Sand Saga’, decorative sand, an ingredient bought in craft stores mostly to make simple candles or pour in layers into a glass is diverted by Cynthia’s higher power creature. 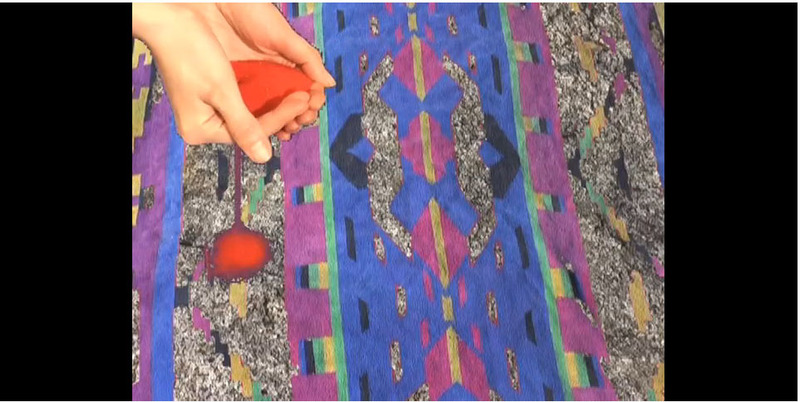 The creature makes a sandpainting of a reproduction of a navajo blanket, that Cynthia lies on and receives a healing session, where her higher self uses a pseudo-modernist knick knack to cleans her chakras. There is perhaps a critique here: everything references the earnest roots of indigenous healing, but symbols and ceremonies are improvised and misguided through the outsourced nature of Cynthia’s objects. She doesn’t quite understand her surroundings that she so deeply identifies with, referring back to Jorn’s idea that “(…) the materialist acknowledges that as a human being he is part of the materials and substances and can not be separated from nature (…)”. I am lead to what one can read as Cynthia’s existentialism; her inability to separate herself from her surroundings due to her vast reserves of empathy that she seems to recharge herself with when she connects to them. In ‘Whispering Pines #9′, this culminates in her mistaking her Avon Foot bath with a valuable Zuni Vase and even making a trip to the Antiques Roadshow herself. In the end, she takes solace in the object’s absurd healing functionality and literally regenerates herself with a footbath. When getting to know Cynthia, Moulton’s portrayal of her inability to separate from, or to use the objects of a mise-en-scene as catalysts of affect, can be linked to two references: David Lynch’s ‘Twin Peaks’ and the films of Douglas Sirk. In relation to Jorn’s ideas of not separating with nature and “spontaneous arabesque” (and a materialist identification with nature), it is almost as if the contemporary impossibility of being “natural” becomes a point of stress or trauma. 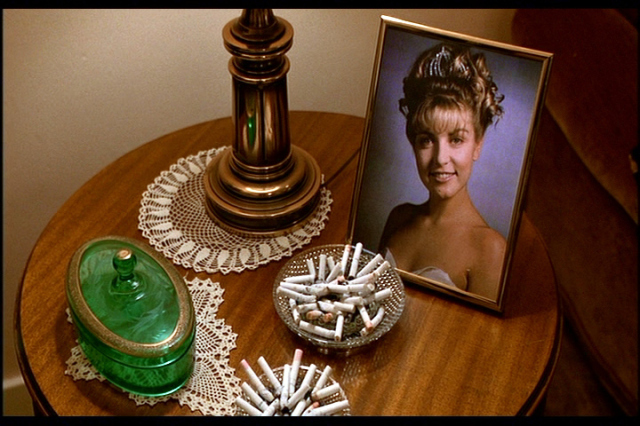 The quirkiness of ‘Twin Peaks’ is also, like Cynthia’s world, initiated by characters who over-emphathize with inanimate objects (such as the lady of the log), or painstakingly hyper decorated sets which have the opposite effect of Cynthia’s surroundings, as they communicate a subtle doom, but this doom seems to correlate to Cynthia’s new age sensibility. In points of crisis, the activation of setting and ornaments that inhabit it are activated to show this dark imbalance. For example, in ‘Twin Peaks’, episode 14, a brilliant long pan is used to show the suffocating atmosphere of the knick knacks and ornaments of the Palmer Family’s living room which culminates in the murdered Laura Palmer’s cousin Maddy (played by the same actress who wears a brunette wig) announcing her need to leave Twin Peaks. Later in the episode we return to the living room, where Mrs. Palmer has been drugged by Mr. Palmer (possessed by Killer Bob). 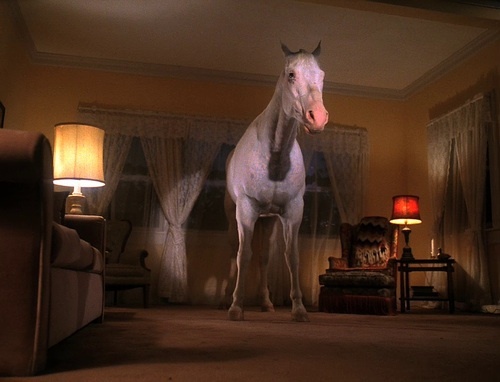 The living room becomes a platform for the invocation of the Pale Horse. The following scene has Maddy murdered in the same living room. The final blow is delivered when she is thrown headfirst into the pastoral painting that the living room scene begins with. Here is Mrs. Palmer, the quintessential existential housewife, trapped in her domestic reality, like Cynthia, but without any new age healing mechanisms. Like Cynthia, the characters in ‘Twin Peaks’ almost psychically bond with their synthetic environments and artifice evokes empathy. A post-Jorn reading of this, could connect the environment of Twin Peaks, and of Cynthia’s interior contructions, as attempts to balance multitudes of reference, to create a sort of universe where the unbalanced patterns of nature are renegotiated. In Sirk’s film ‘All that Heaven Allows’ a rich widow (also wearing an existential housedress) tells her spoiled, materialist children that she plans to marry her bohemian gardener. Douglas Sirk, ´All that Heaven Allows´, still. A paravent dividing mother and son resembles a prison. 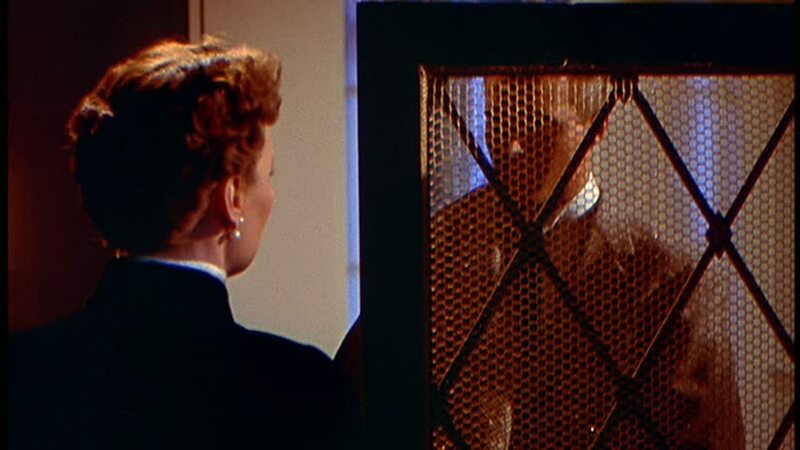 Douglas Sirk, 'All that Heaven Allows', still. The daughter’s bedroom, features a pre-new age window that channels light into a prism. But instead of providing healing properties, the prism’s colourful lights are projected onto the characters and illuminate their misery in a colorful rainbow. Like Cynthia’s charged settings, Sirk invokes the power of decoration from the point of view of imbalance, of the impossibility of an authentic “materialist” reality, but how aspects of “spontaneous arabesque” can be channeled into novel catalysts of affect. May 31st, 2014, posted in Public Sessions and Lectures, What is an Ornament?